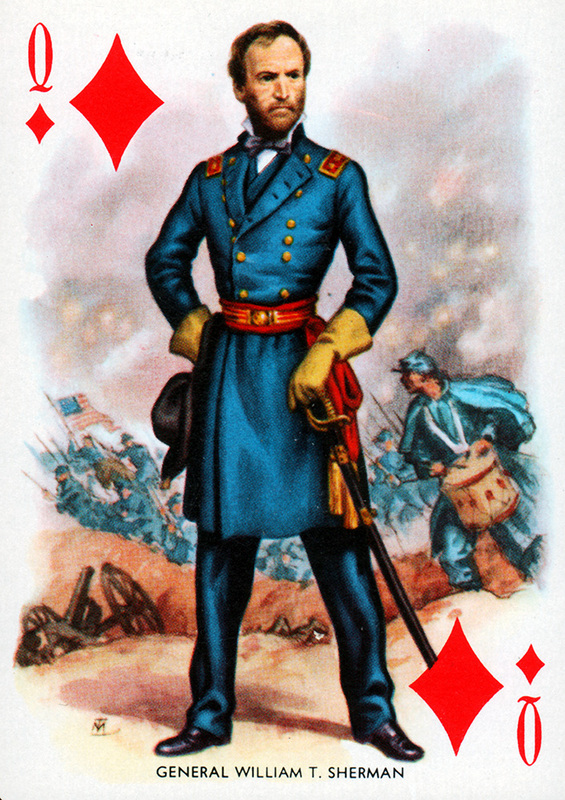 4/3/19 - Posted Grant playing card, Lee playing card and Sherman playing card. These are nice... I'd like this deck! 3/18/19 - Posted The Truths Of Being A Civil War Reenactor. 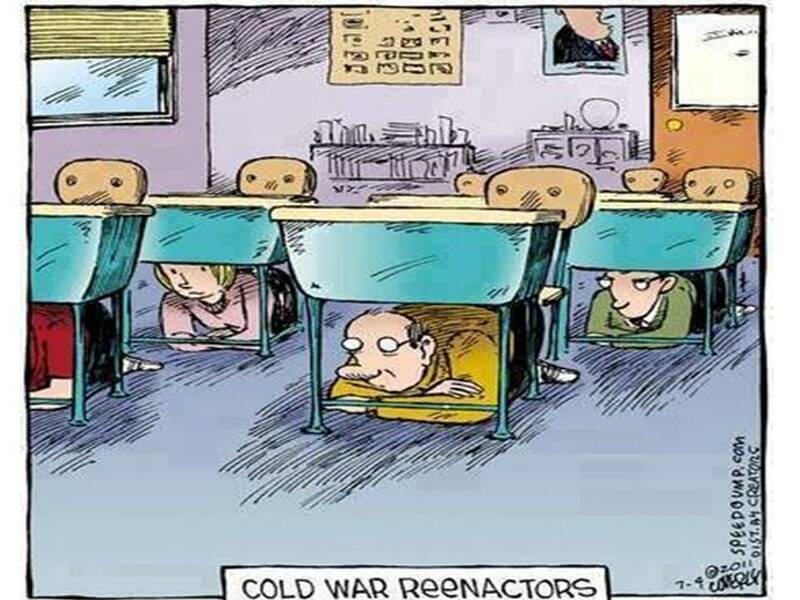 2/22/19 - Posted Reenacting the Global War on Terror. 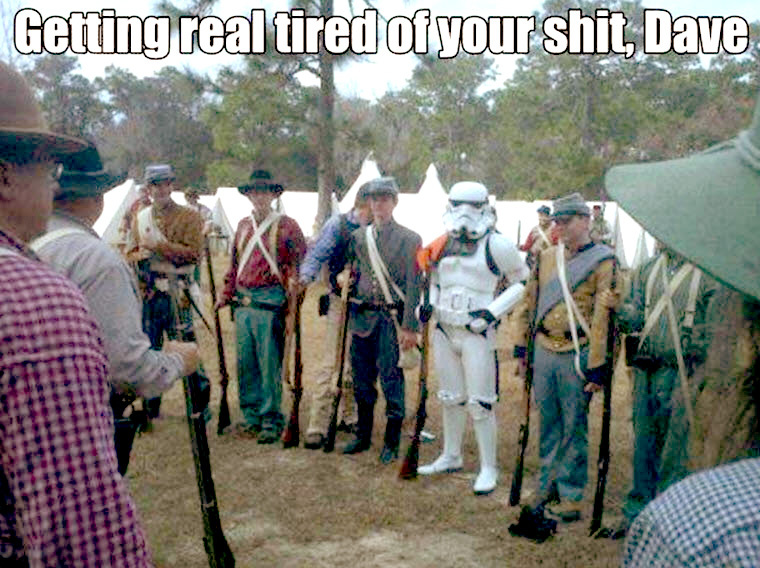 2/13/19 - Posted Civil War Reenactments Were a Thing Even During the Civil War. 1/17/19 - Posted The Last Civil War Check. 1/2/19 - Happy New Year! Yes, old Jonah is still here at his post, malingering, getting others to fill his canteen for him and trying to stay warm under this crummy dog tent. I don't reenact anymore but I intend to keep adding to this site for as long as I live. (We'll see how long that New Years Resolution will last.) I added The Reenactor's Brave New World. It appears that I'm going from active 125th anniversary reenactor to chronicler of the hobby's long, slow demise. Sic transit gloria mundi. I also posted Celt Reenacting in Germany. 12/20/18 - Added Loading a musket. 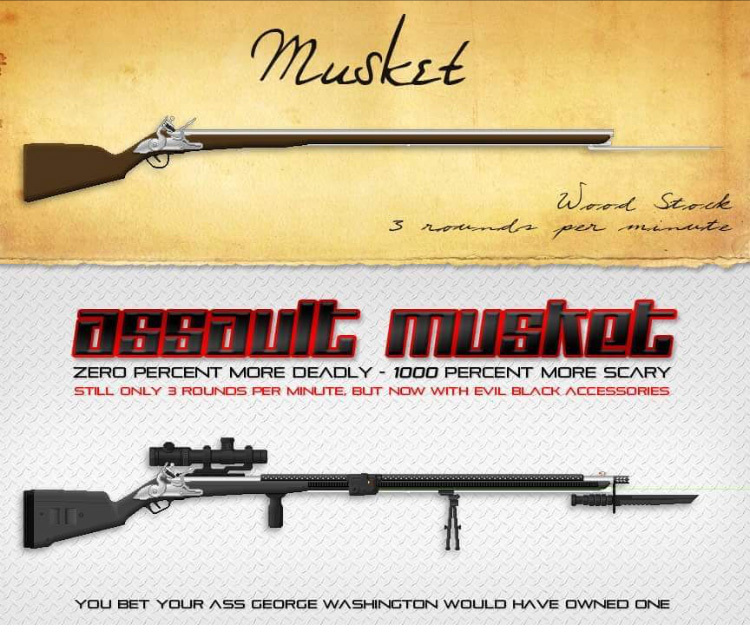 Yeah, I know, it's 18th C. and not Civil War - but I like it. Oh, geez, look at the time of the month. It's Christmas time once again, so I direct you to my now-ancient Christmas Page. 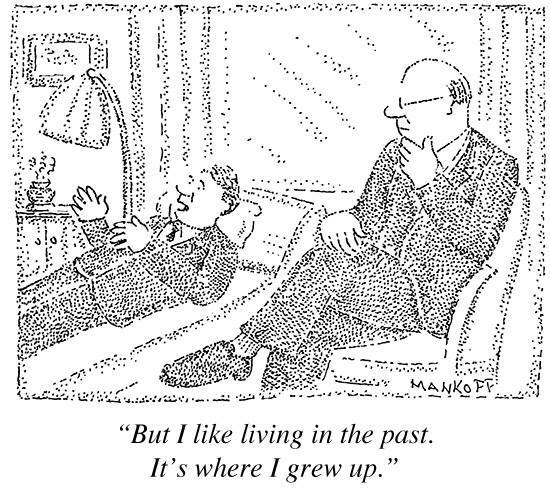 It may have been funny in the 1990s... I feel that Is there a Santa? is a classic, however. Merry Christmas! 9/11/18 - Added The Decline of the Civil War Reenactor. 9/10/18 - Added What Actually Happened on Plantations When the Slaves Were Freed. 8/29/18 - Added Civil War doctor. 8/20/18 - Added a book review: Madcap Military Mayhem by Benedict le Vay. 7/24/18 - Added another entry to Stu Zelman's The Civil War/World War II Connection (scroll to the very bottom). 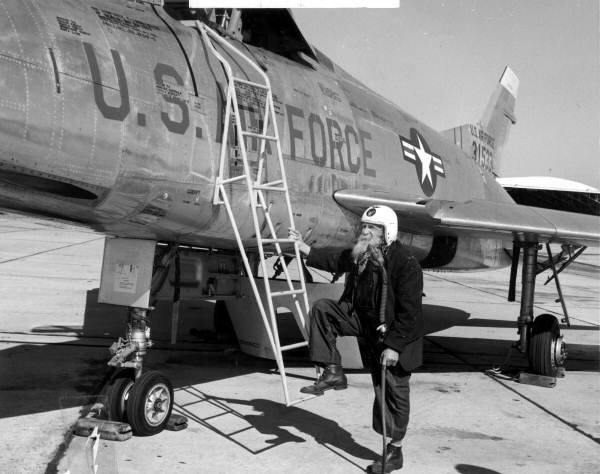 7/19/18 - Posted Florida's last Civil War veteran Bill Lundy poses with a jet fighter, 1955. 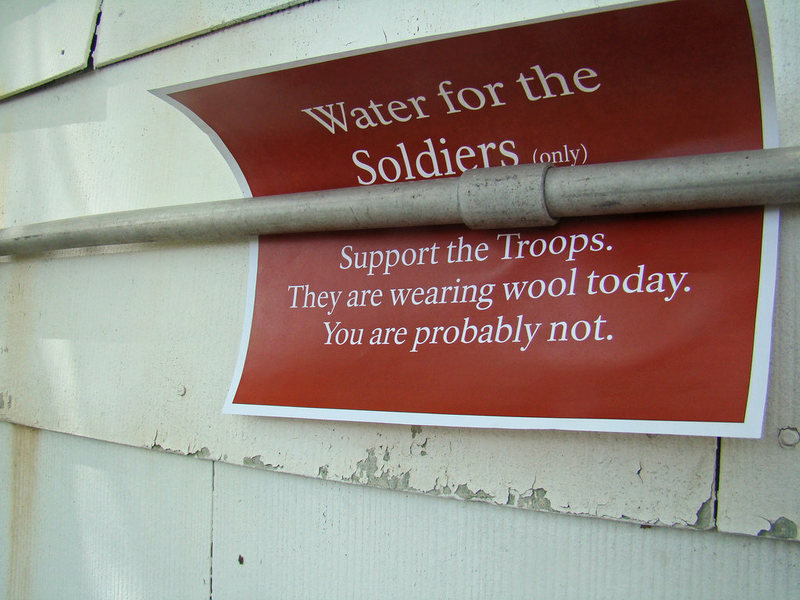 7/12/18 - Yes, Soldiers water only! 6/27/18 - Good news! Reenactor video classics are now available for viewing on YouTube at the LionHeart FilmWorks page. Be sure to see New Market... A Field of Valor and Stonewall's Valley, reenactor cult videos which used to be shown at the New Market Battlefield Visitor's Center. There are also some of those Classic Images videos of 125th anniversary events from the mid-1980s here as well. 6/26/18 - Posted Grandpa Goes Modern. 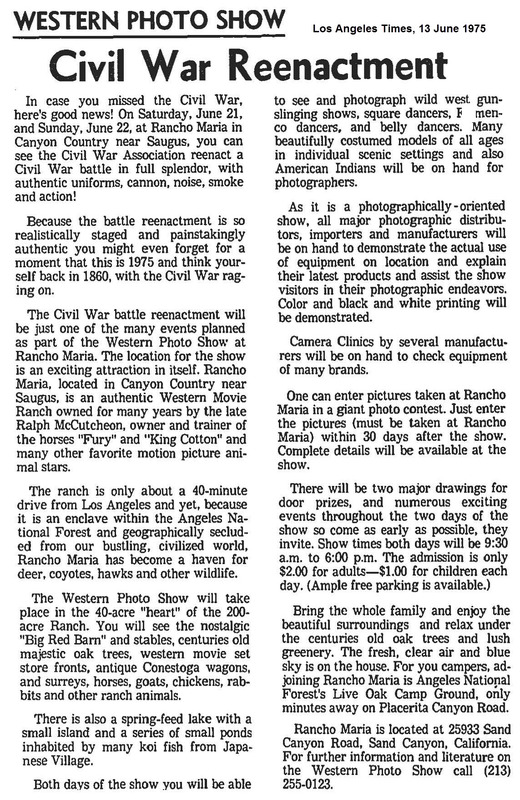 4/25/18 - Posted 1975 Rancho Maria (CA) reenactment. The Wild West, square dancers, koi, flamenco dancers, belly dancers, American Indians and - Civil War reenactors. Southern California in 1975! 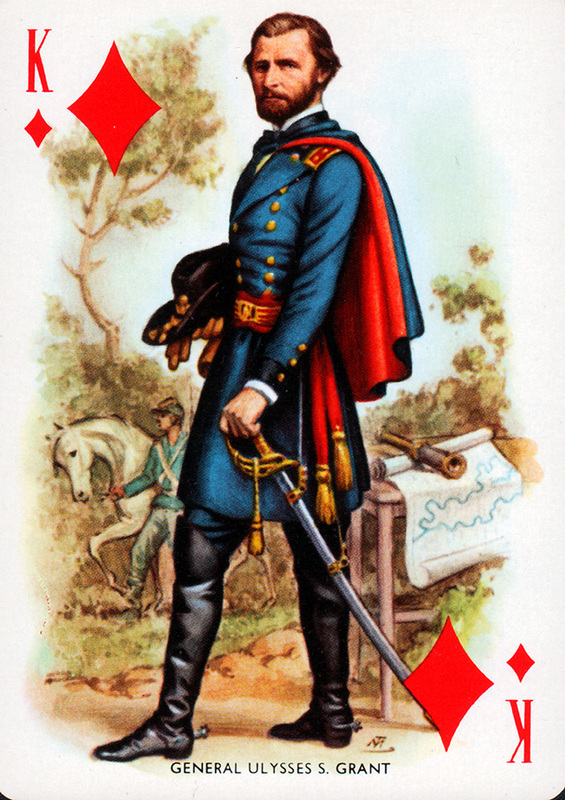 3/12/18 - Posted When Union Soldiers Pick Up Guitars (Billy, Don't be a Hero). 2/13/18 - Posted Will Civil War reenactments die out? 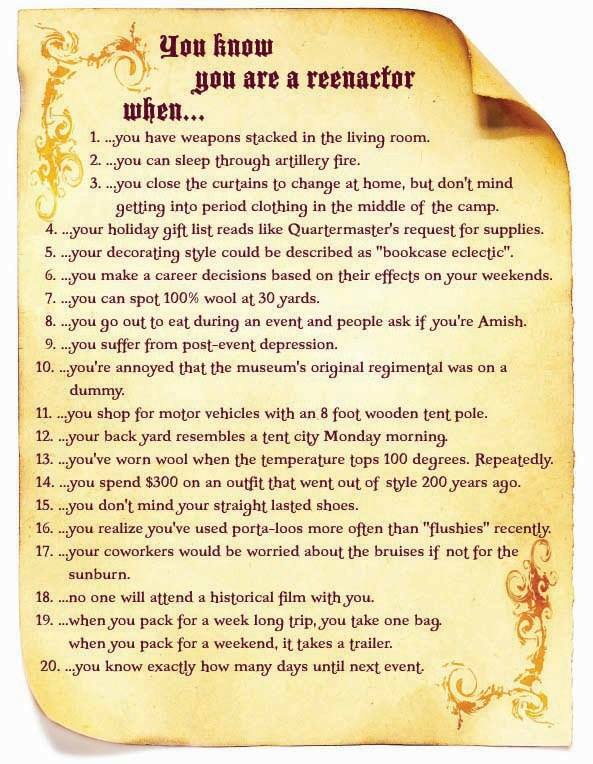 and Civil War reenactment etiquette: How — and when — to die on the battlefield. 11/9/17 - Posted Fooling the Ghosts! 11/8/17 - Posted "Living History" as the "Real Thing": A Comparative Analysis of the Modern Mountain Man Rendezvous, Renaissance Fairs and Civil War Reenactments by Patrick McCarthy, one of them there scholarly pieces about reenacting history. 11/3/17 - Posted The Vietnam Returning Vet Experience and Joshua Chamberlain Gets the Bird. 10/27/17 - A pipe bomb at a reenactment? Whhhaaaat? Click 2017 Cedar Creek After-Action Report. 9/14/17 - Ross Kimmel sent me a new photograph of the Black Hats at the 1961 Manassas event. Click here and scroll down. 5/25/17 - I've read a lot of interesting articles about the American Civil War, but this one stands out because it's unique: Outdoor Sound Propagation in the U.S. Civil War. Thanks for alerting me to it, Bob Avery! 2/27/17 - Posted 25 Colorized Photos So Vivid They'll Change How You See the Civil War. 2/17/17 - Posted The man who dresses up as his ancestors. 2/10/17 - Posted Russian sailor killed in U.S. Civil War commemorated in Maryland. 2/3/17 - Posted Mormons in the Civil War: Their Own Cavalry + More Fascinating Facts and Explosive Bullets of the Civil War. 1/13/17 - Happy New Year, pards! 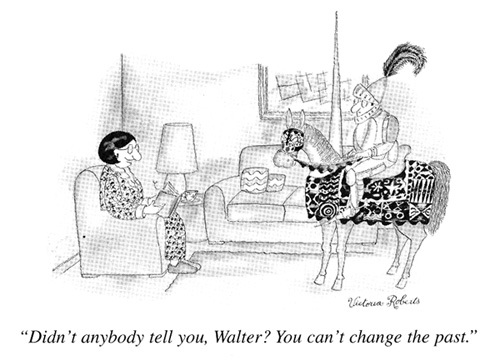 Oh, the indignity! U.S. Grant's head on Saturn Girl's body. It must be noted that the bandanna works, however. 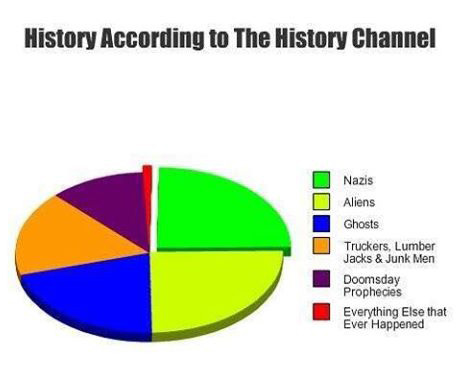 10/18/16 - Posted Truth about the History Channel. 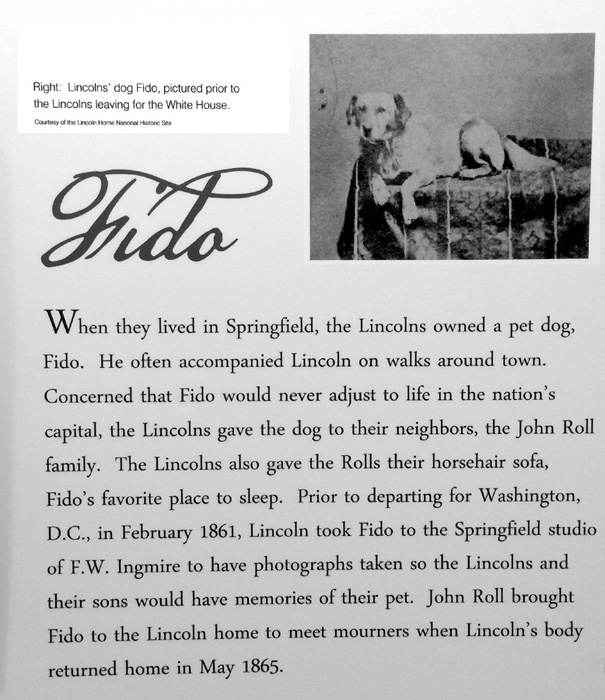 10/11/16 - Posted Fido to Lincolnia. 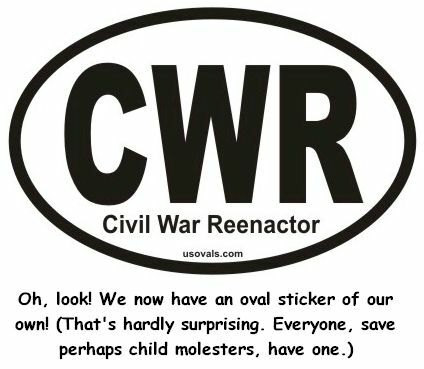 8/24/16 - Posted Fewer People Participate In Civil War Reenactments. Well, according to the NPR. If you believe them. Also posted The Birth of Civil War Reenacting and Civil War re-enactor shot; shakes die-hards. 7/14/16 - Posted a photo of Eisenhower and the Blackhats to the Ross Kimmel memoirs. Scroll to bottom. 5/18/16 - Posted a link for What They Fight For: The Men and Women of Civil War Reenactment, a scholarly paper by Christopher George Bates. It's generally excellent, but it has some small issues... the "Jonah Begone" cited on page 129 is some pretender in the 7th VA, not me. I created the name in 1987. The Jonah Begone cited on page 178, however, is me, the REAL Jonah Begone! Footnote #70 on page 189, which cites an article I wrote, gives the year of publication in the Camp Chase Gazette as 2003. This is incorrect. It was 1993. And on page 205 the author states that Umberto Eco's best known work is Travels in Hyperreality, This is incorrect. It's certainly The Name of the Rose, which was made into a Sean Connery film in 1986. Finally, the author seems to be unaware of this website, and the wealth of reenactor lore it represents. His loss! 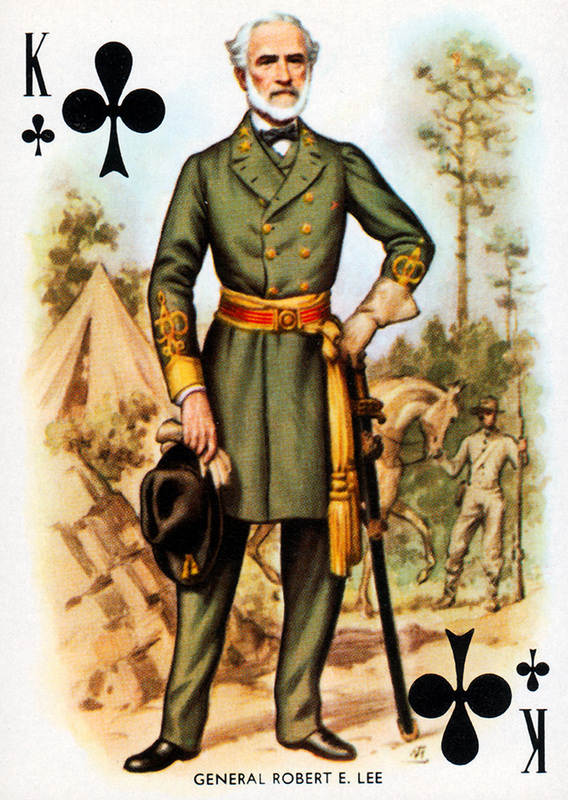 4/22/16 - Posted St. Patrick's Day, 1865. Party hardy. Also posted Veteran Reunion. 4/12/16 - Posted Assault muskets. Because scary can be authentic, too. 3/24/16 - I make sense of the 1980s and 1990s reenacting scene as it applied to me on videotape: Reenacting videos. 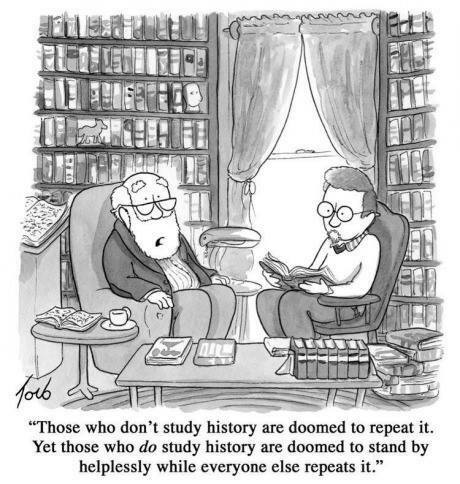 Also, How many historians does it take to change a light bulb?. 3/10/16 - Posted Luther Sowers Takes Hits (c. 1965). It seems that the guy who wrote this article (unknown paper, unknown date) was far more interested in creative writing than he was to simply report the story. 3/4/16 - Posted A Dutch company attempts to map every battle on earth. Why, of course the American Civil War is in it! 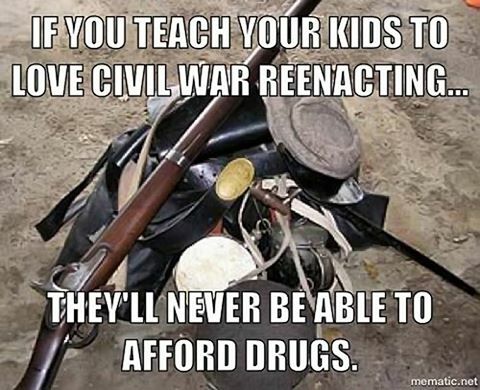 Also posted Should Civil War re-enactments be abandoned?. 1/31/16 - Somebody sent me a link to this amusing little video: The Farbs, and I figured I could make one of my own with the oddball images on this site. So I did: Jonah's Image Collection. 12/17/15 - I don't know why I didn't link to this article here in August when I did this, but here's my I Sold My Stuff! or, Jonah's Last Event article. I'm done! Also, Merry Christmas! My Christmas articles page. 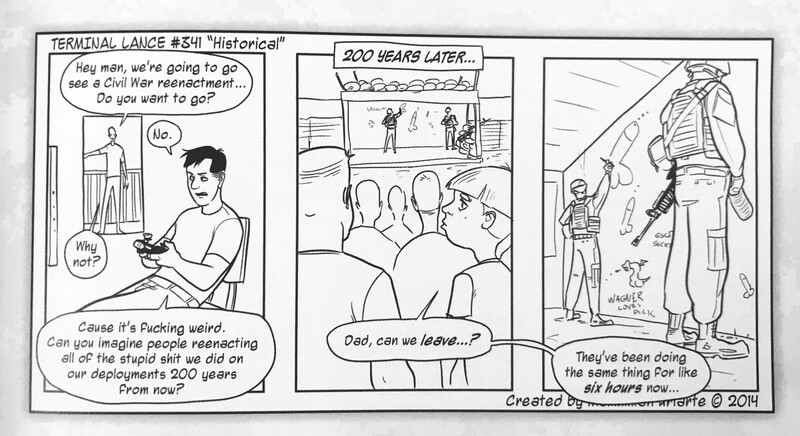 11/6/15 - Posted 1951 Reenacting. I don't know how authentic this is, but here it is. I do not vouch for the 1951 attribution. 5/7/15 - Posted Playing "Taps" for the (Keokuk) Reenactment. 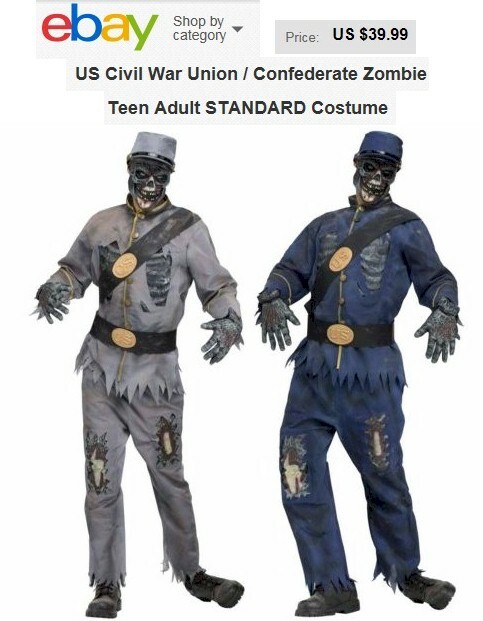 4/23/15 - Posted Blue and gray zombie costumes. 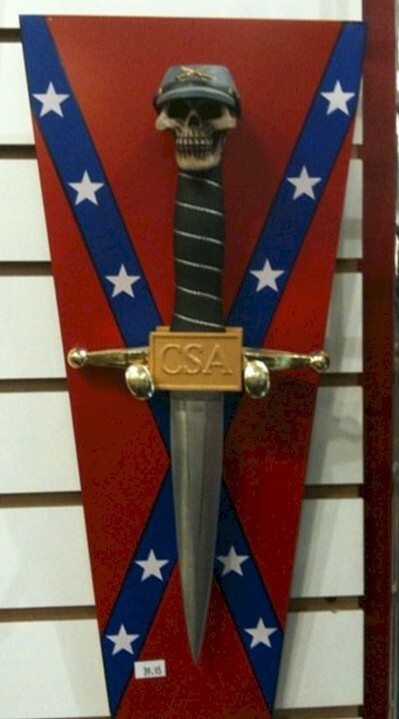 The South Will Rise (From the Dead) Again! But so will the North. 4/8/15 - Hey, look what made it into the National Archives! 1990 125th Anniversary Appomattox surrender event, part one and 1990 125th Anniversary Appomattox surrender event, part two. Over an hour of footage! I have added it to my Civil War Youtube Playlist. I was at this event with my unit. 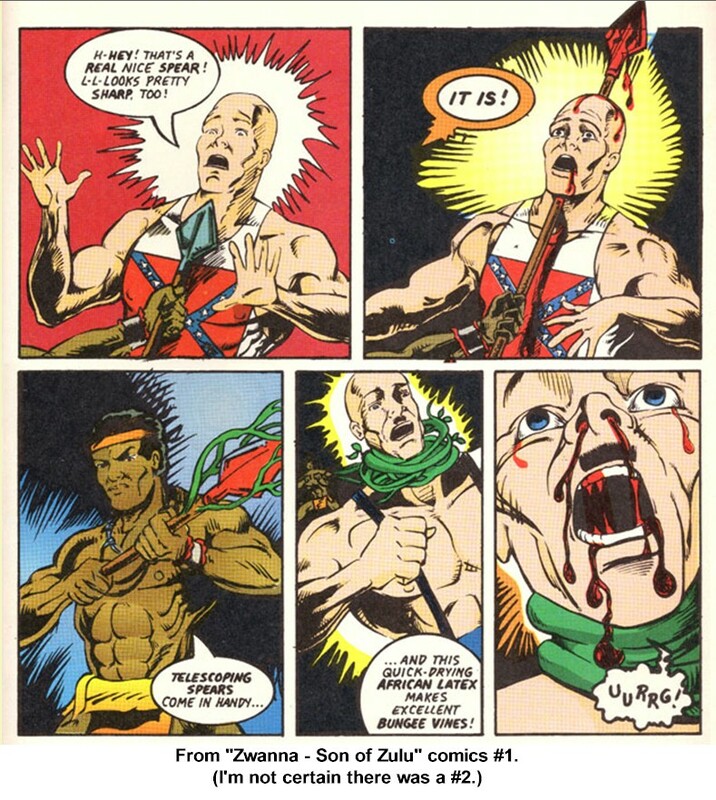 I'll never forget it - namely because some of the Rebs looked so comically ridiculous, which inspired this piece. Wow... 25 years ago. Tempus sure does fugit. 3/4/15 - Key and Peele on the auction block. "My question is, how did they catch him?" Hahahaha! 12/16/14 - Posted Conan meets the Lincolns to Lincolnia. And, once again, I encourage you to check out the Christmas section of this venerable old website. 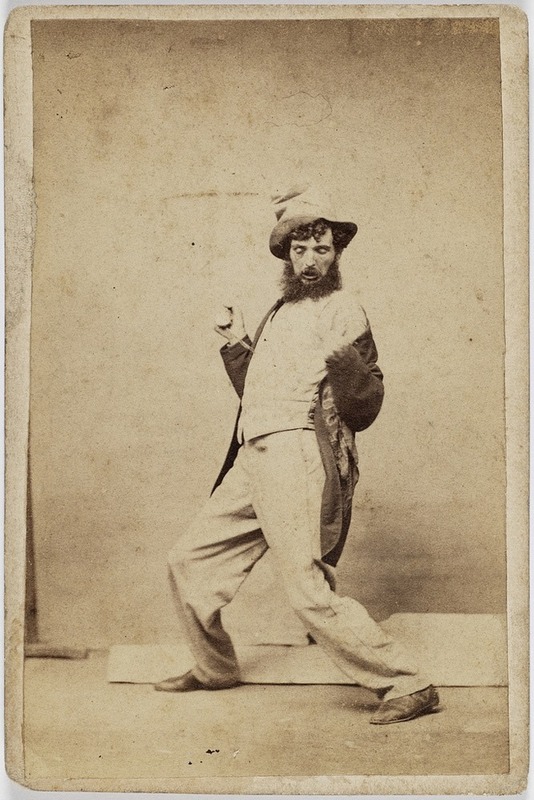 11/19/14 - Posted Wierd Victorian Guy. I do not know if he had any connection with the American Civil War, but he should have! 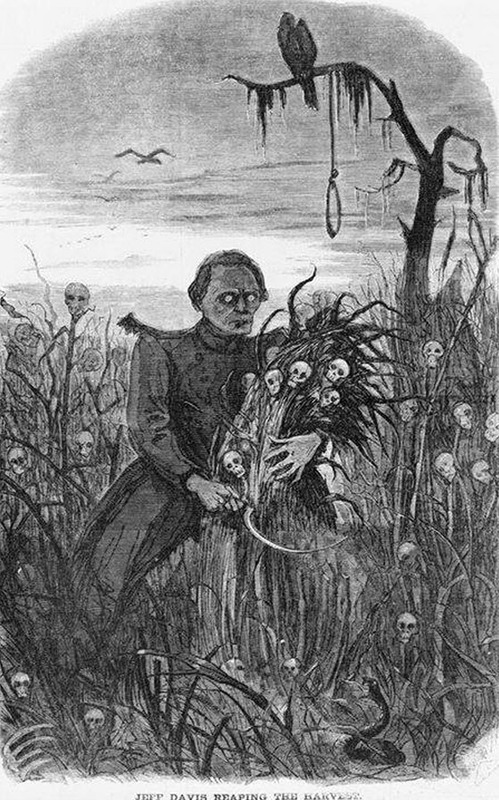 10/31/14 - Posted From the 10/26/1861 Harper's Weekly. 10/9/14 - Posted Dear Friend. 10/2/14 - Posted "Marines at the Battle of the Wilderness" from Leatherneck. 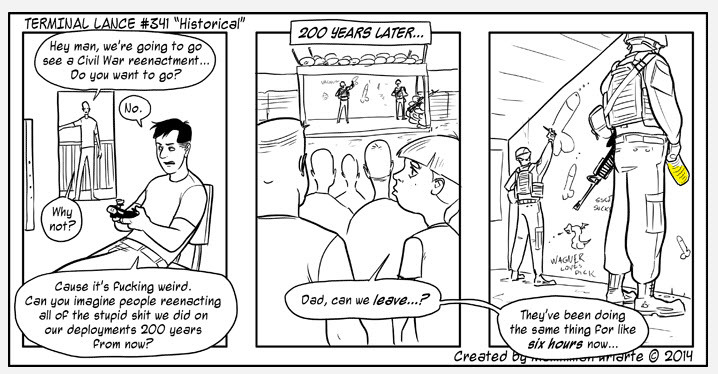 8/19/14 - Posted Terminal Lance: Reeactments. 8/5/14 - Posted Kazuhiro Tsuji's hyper realistic Lincoln bust to Lincolnia. 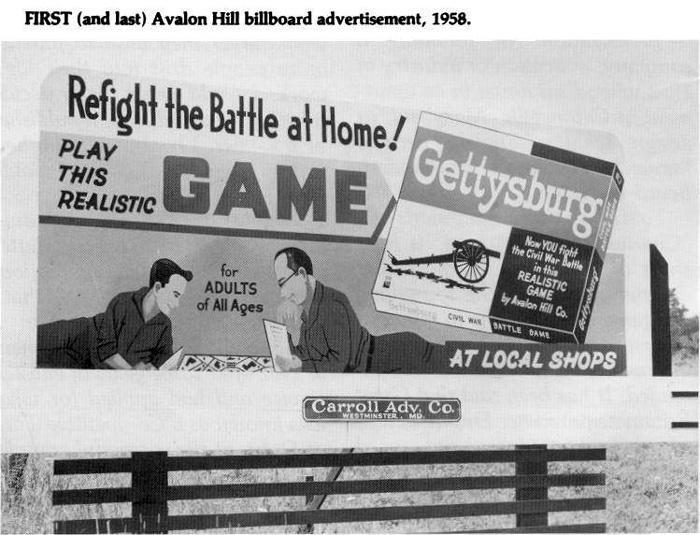 7/1/14 - Posted 1958 Avalon Hill Gettysburg billboard. And, with permission of the author, I posted Marines at the Battle of Gettysburg, 1922, describing the reenactment the U.S. Marine Corps did there. It is the author's contention that, in the 1920's reenactments they did, the USMC basically invented modern reenacting in Virginia. Does anyone have an account of a reenactment earlier than this? 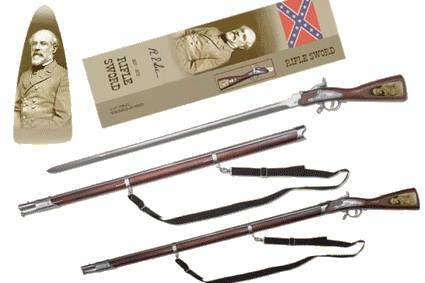 6/18/14 - Posted Saltpeter Poetry, The Manliness of Taking Cover and the The Lee Rifle Sword. 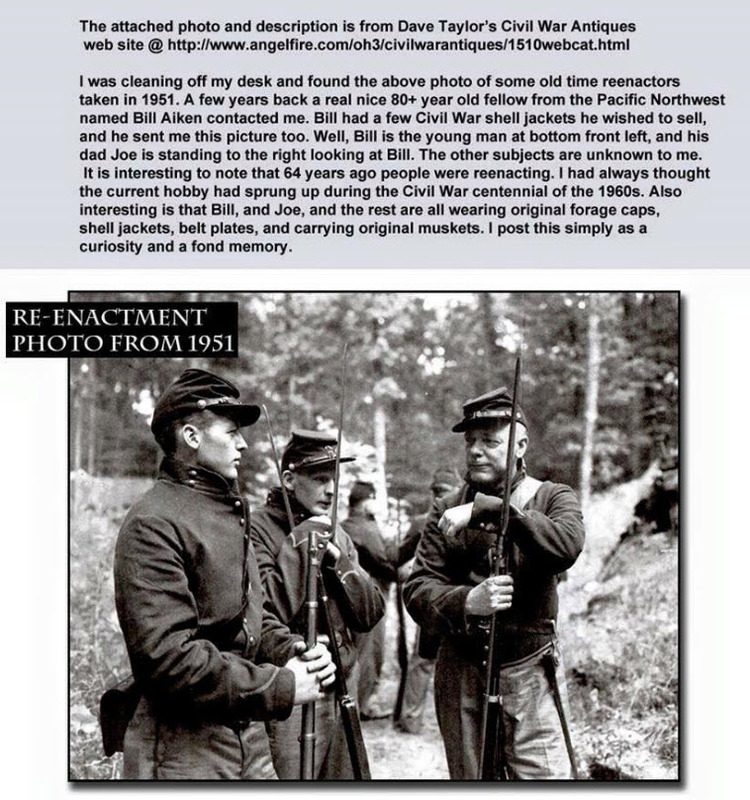 5/29/14 - Posted The foolishness of Civil War reenactors, a foolish article. My rebuttal at the end. 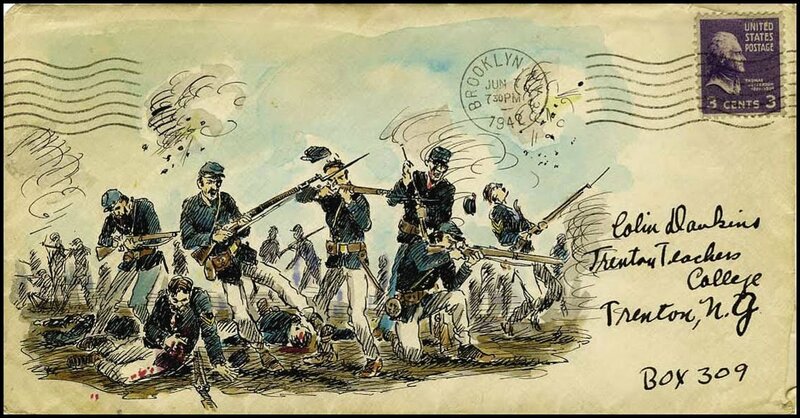 4/27/14 - The rise and fall of Civil War reenacting. I guess I get to chronicle both. 3/31/14 - I have received the sad word that Harry Dierken passed away on February 11, 2014 at age 90 (he was about to turn 91). Rest in peace. 3/27/14 - Added Doom, study and repeat. 3/14/14 - Added the 1946 Three Stooges short Uncivil War Birds: Part one, Part two. Note Moe's incredible line "Y'all ejaculated a mouthful!" and the effortless stack arms in part two at the 4:20 and 5:01 points. I see in 1946 people thought sideburns were common in the Civil War, a misunderstanding that persisted into the 1960's when I first became aware of it. 2/10/14 - Added three new/old photos to the Ross Kimmel Memoirs. If you haven't read these, you should. They are excellent! 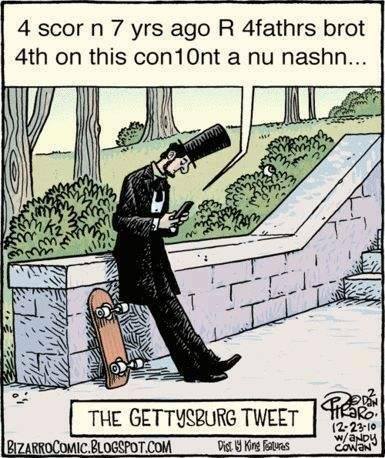 1/28/14 - Added Lincoln Tweet. 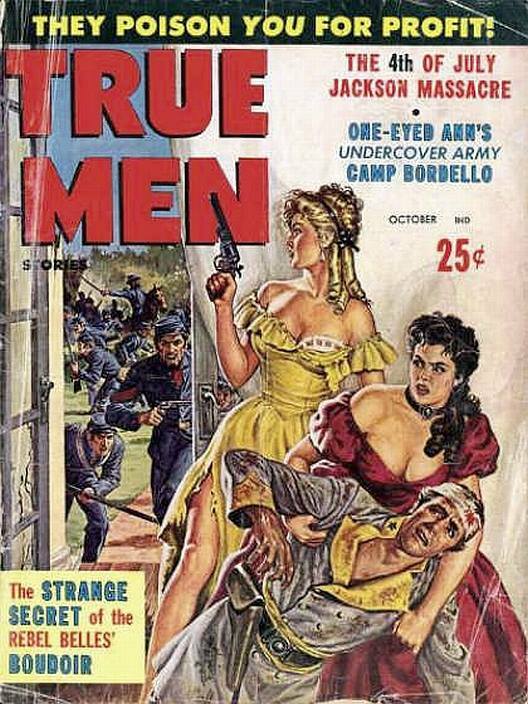 1/23/14 - Added True Men (Oct 1960), True Men (1959), True Men. 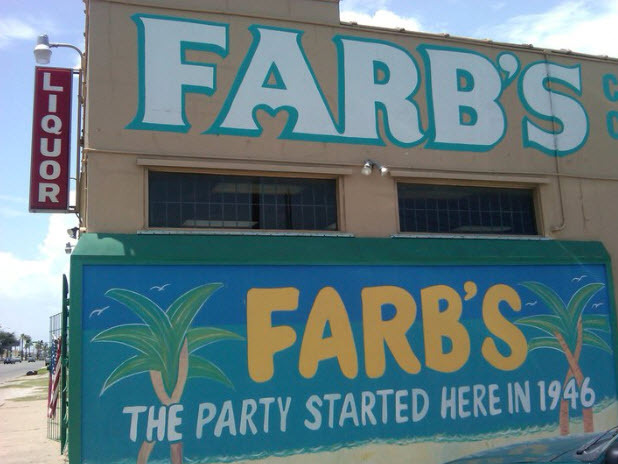 Thanks to whomever posted these classics on the Happy Farbs Facebook page! 1/17/14 - Added Farb's Liquors (Galveston, TX). Yeah, I could totally work there. 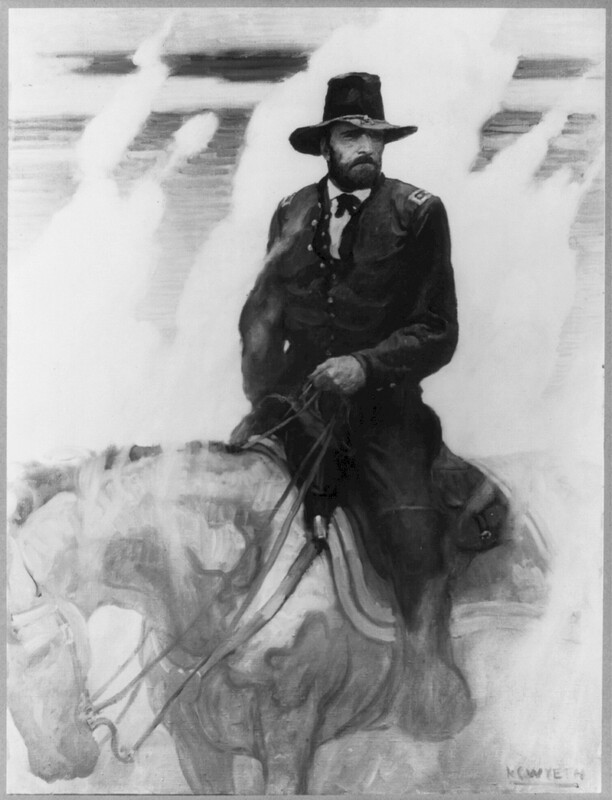 11/14/13 - Added "The Arsenal at Springfield" by Longfellow. Why? Why not? 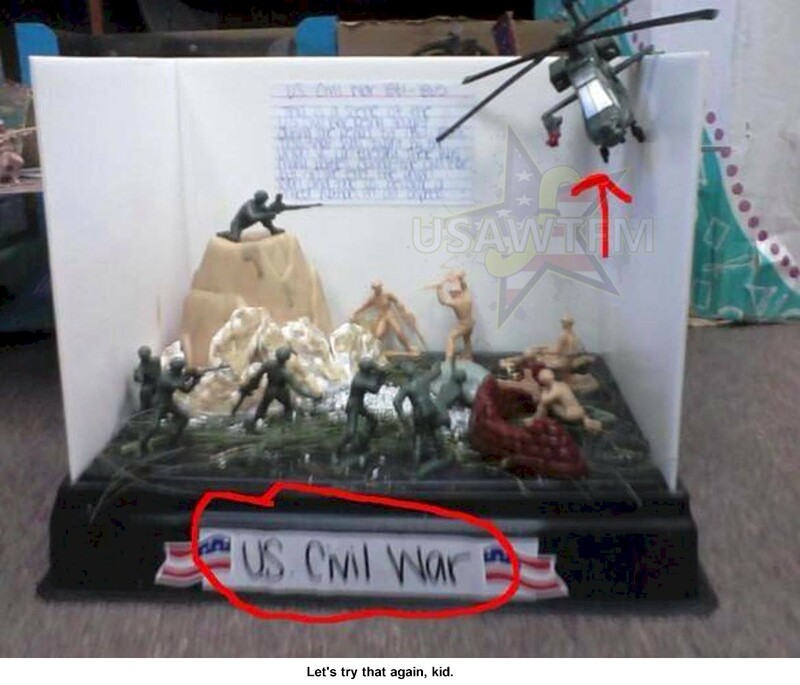 10/15/13 - Added Kid's Civil War Display. 10/1/13 - Added another entry to Stu Zelman's The Civil War/World War II Connection (scroll to the very bottom). 8/28/13 - Added Computer Grant. 8/7/13 - Added another entry to Stu Zelman's The Civil War/World War II Connection (scroll to the very bottom). 8/5/13 - Added another entry to Stu Zelman's The Civil War/World War II Connection (scroll to the very bottom). 6/11/13 - Added an entry to Stu Zelman's The Civil War/World War II Connection (scroll to the very bottom). 4/24/13 - According to a Facebook ad, Reb Vets Return to School. Well that's nice to know. 4/18/13 - I am pleased to announce that the reenactment of the atomic bombing of Japan political flap is alive and well! Click here- scroll to bottom. 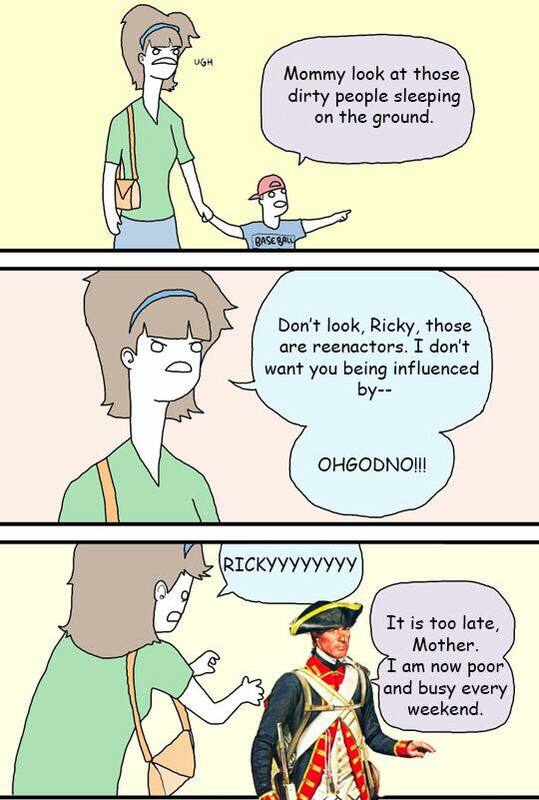 You'd think that reenactors, of all people, would learn from the past - but no. 4/8/13 - Added Conan O'Brien Becomes a Civil War Reenactor. 4/2/13 - Added Fly Reb to the Army of the Potomac Enemy Recognition Manual #TR-10A. 2/14/13 - Added What Do Modern Day Americans Think of Abraham Lincoln? to Lincolnia. As to the knowledgable quality of the survey responses, I shall but invoke William Tecumpseh Sherman's "Vox populi, vox humbug." My thanks to Jonathan Steplyk for calling this to my attention. 1/4/13 - As a part of the general fixing up that I've been doing around here, I added some more of Charles W. Reed's brilliant Hardtack and Coffee line drawings to the various feature pages. 1/2/13 - Last month one of the greats departed: Bill Keitz obit. 12/29/12 - After sixteen years I figure it's time to spruce up the site a little and make it display more in accordance with the 21st C. world and its wider monitors. So I have added a new front page and reformatted all the .html pages so that they display in the middle of the monitor at a readable text length. Old dogs can indeed learn new tricks. Is it fully compatible with the mobile world? Well - more than it was. I think. Truth to tell, despite the fact that I have created and posted literally hundreds of web pages, I am ill at ease with HTML and CSS coding (as any HTML or CSS validator will quickly tell you). I like content, not coding. Happy New Year! 12/3/12 - Posted Santa's Living the Dream; this is a Christmas card I once got from a reenactor... Also added From Cotton to Tee Shirts: The Role of Cotton in the Civil War. 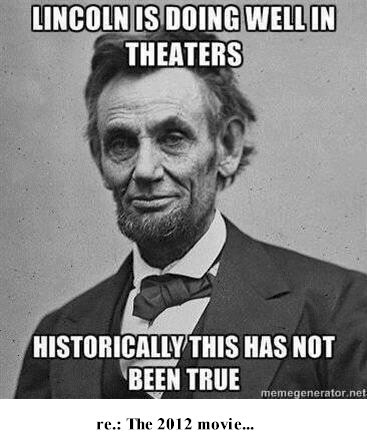 11/30/12 - Posted Lincoln in theatres to Lincolnia. 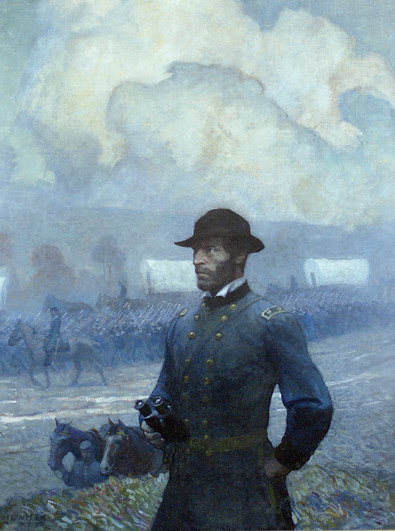 Also, posted Catharsis, Revision and Re-Enactment: Negotiating the Meaning of the American Civil War. 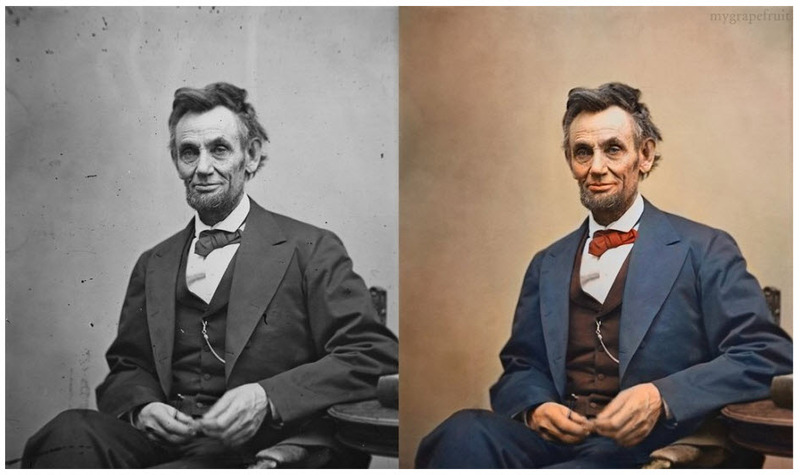 11/28/12 - Posted Colorized Lincoln to Lincolnia. Also, posted Bang, Bang, You're History, Buddy, The Skirmish Will Be Followed By a Ladies' Tea and Buff, as in Civil War (a tortured essay about a four letter word). 11/27/12 - Posted Historical Re-enactment, Extremity and Passion by Jonathan Lamb of Vanderbilt University. 11/23/12 - Posted At Civil War commemoration, reenacting the battle for souls and Reenactors Reliving Glories They Never Had and The reenactment: How do the "soldiers" know when to die? Hope y'all had a good Thanksgiving! 11/15/12 - Warning to all skinheads wearing Confederate flag-themed wife-beaters: Beware of Zwanna. 10/29/12 - Posted Book Review: Stonewall Hinkleman and the Battle of Bull Run by Sam Riddleburger and Michael Hemphill. 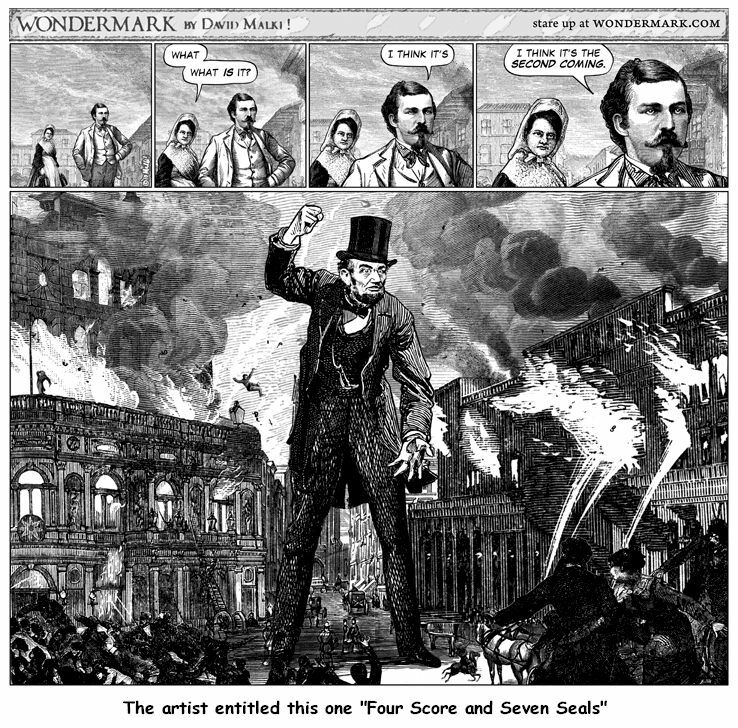 10/1/12 - Posted Lincoln Assassination Eyewitness Samuel J. Seymour and his 1956 appearance on I've Got a Secret to Lincolnia. 9/19/12 - Okay, here's something you really ought to read if you're a reenactor: Dr. Cathy Stanton's Being the Elephant, her 1997 anthropological look at the reenacting hobby. It's a wonderful read. The quality of its research is guaranteed since - ahem! - she used me as a source and quotes me. :) It's a 28.2 MB .pdf, so it'll take a while to load. 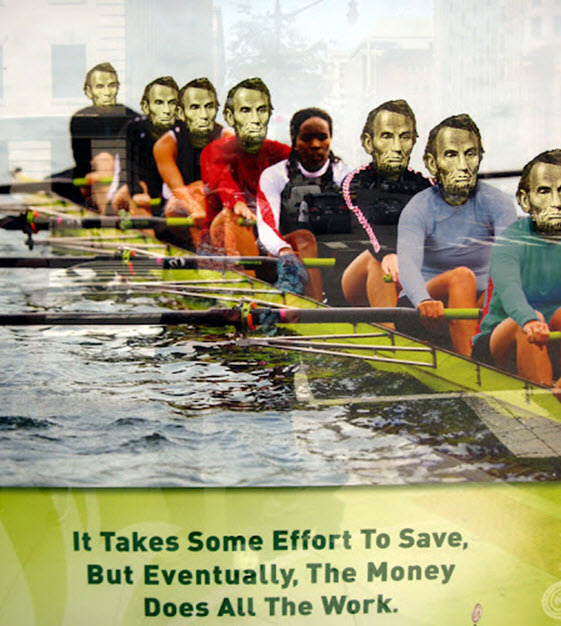 8/29/12 - Posted Lincoln's Image in the Popular Culture and Lincoln Doing All the Work to Lincolnia. 8/6/12 - Posted Yellin' Reb to the Army of the Potomac Know Your Enemies Manual. Something of an occasion, I think... this is the first time I've ever encountered one of these deadly Rebs in person! 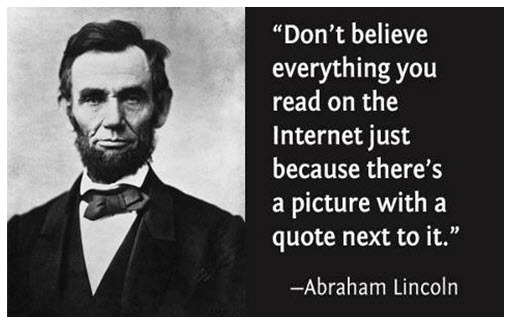 8/2/12 - Posted Lincoln Internet quote to Lincolnia. 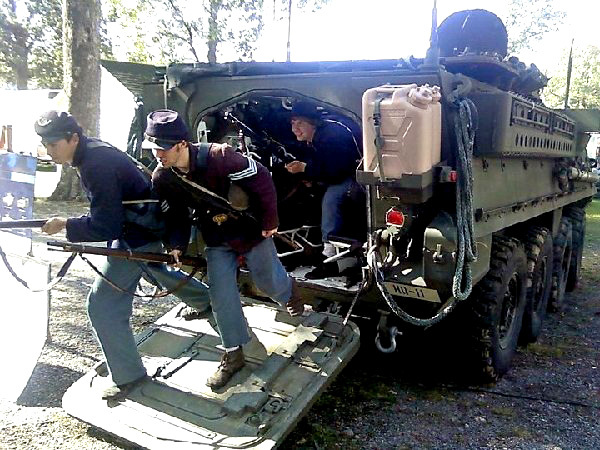 6/8/12 - Posted An 1862 Stryker unit. 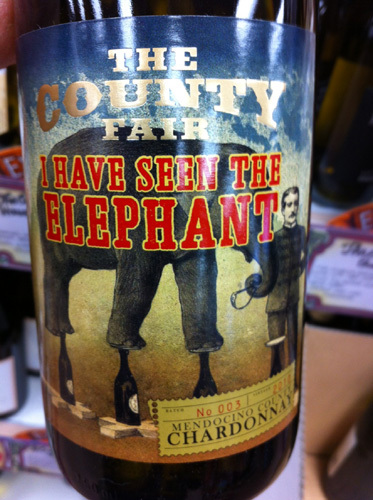 4/24/12 - Posted The wine you drink after your first reenactment. 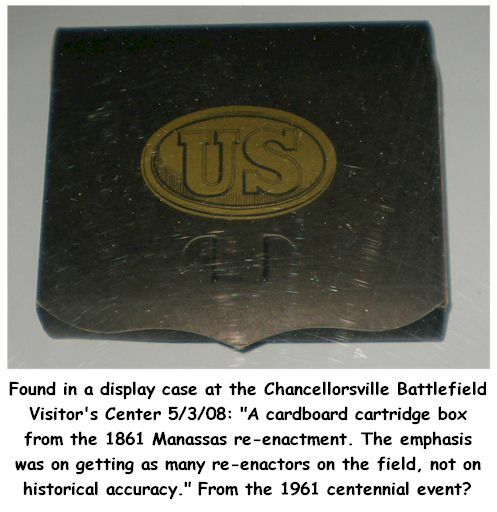 2/17/12 - Posted What Actually Happened With Smedley D. Butler And Stonewall Jackson's Arm? Also, added an entry to Stu Zelman's The Civil War/World War II Connection (scroll to bottom). 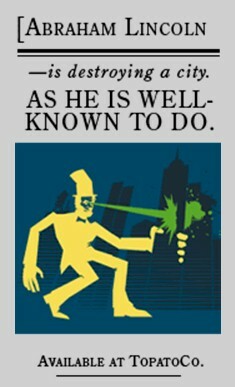 1/26/12 - Thanks to Mal Stylo, I added a hilarious article to the Iowa Graybeards article (scroll down). Snot, waterboarding and an absolute failure of a commanding officer! 1/6/12 - Happy New Year! Added an entry to Stu Zelman's The Civil War/World War II Connection (scroll to bottom). 12/7/11 - Added Capt. A. Lincoln's signature found in Black Hawk War papers . 11/30/11 - Added War Between the States Radio - Civil War audio 24X7X365. 10/19/11 - Added an entry to Stu Zelman's The Civil War/World War II Connection (scroll to bottom). Also, for sadistic little Reb kids, here's the Andersonville Prison Play Set. Deny the little plastic Union figures blankets and food! 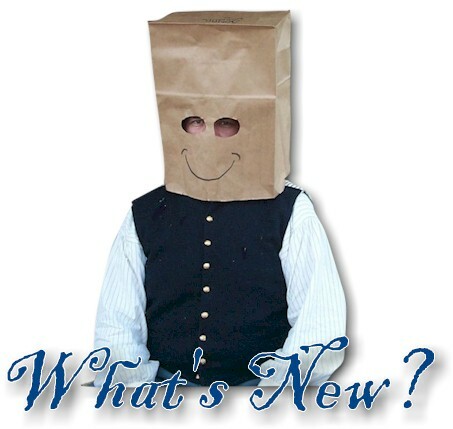 Also added Confessions of a Rookie Re-Enactor. 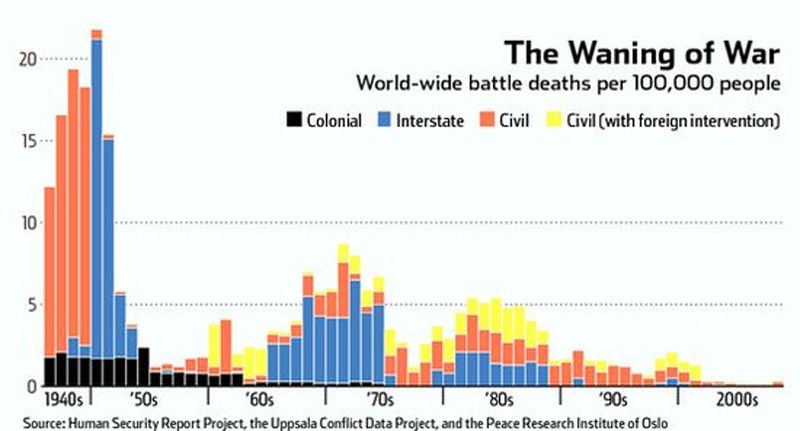 9/30/11 - Well, if you hate war (and I assume you do), here's something encouraging: Battle Deaths, 1940's to today. 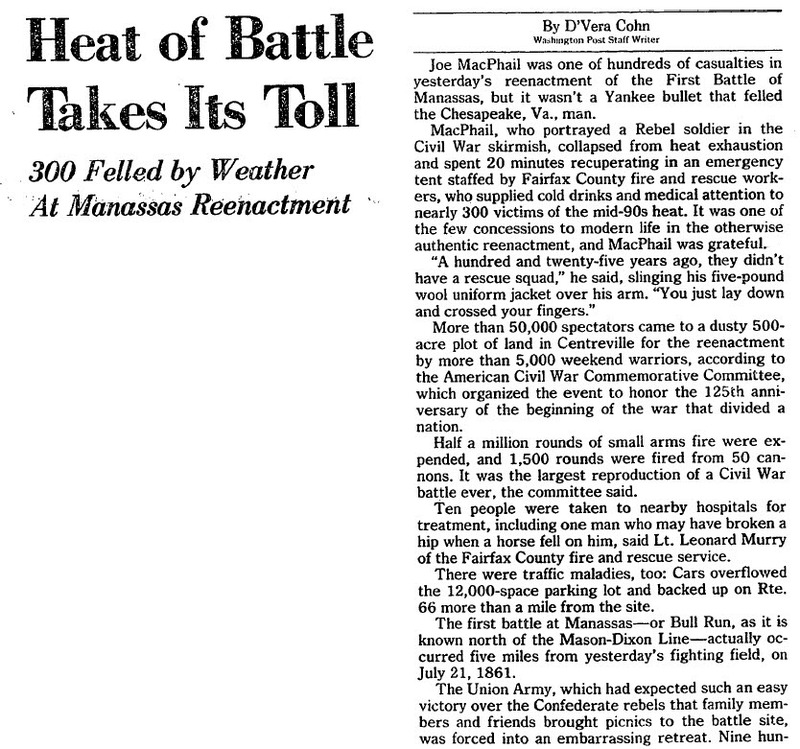 8/18/11 - First Bull Run (or, if you prefer, First Manassas): It was always hot! The 1861 Version ("sweltering heat"). The 1961 Version. The 1986 Version (part one). The 1986 Version (part two). The 2011 Version. All articles from the Washington Post. 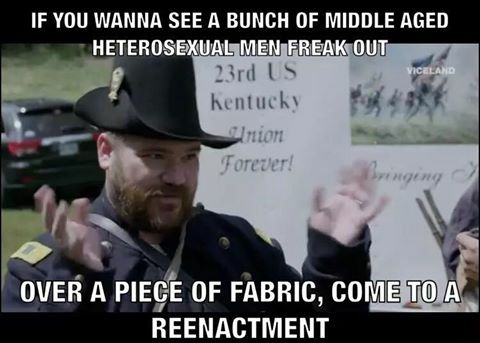 There will probably be a 175th anniversary battle reenactment in 2036. Guess what? It, too, will be hot. It's the state's way of saying, "Hi! Welcome to Virginia! Enjoy the heat exhaustion!" Also, Look who the sutlers were for the Rebs in the 100th anniversary version! 8/16/11 - Added an entry to Stu Zelman's The Civil War/World War II Connection (scroll to bottom). 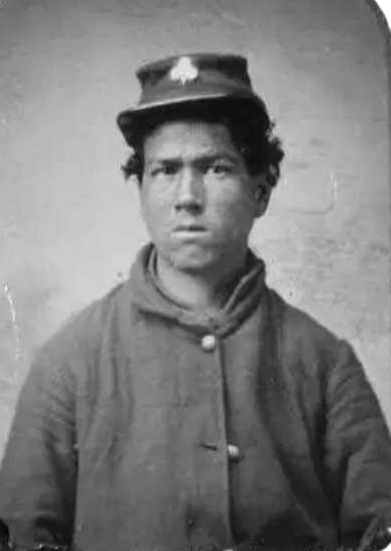 8/9/11 - Posted what I think is a clever and subtle Civil War ghost story: The Soldier Boy's Ghost. 8/8/11 - You always tell when an important anniversary of the Civil War is coming - one that ends in a "0" or a "5." 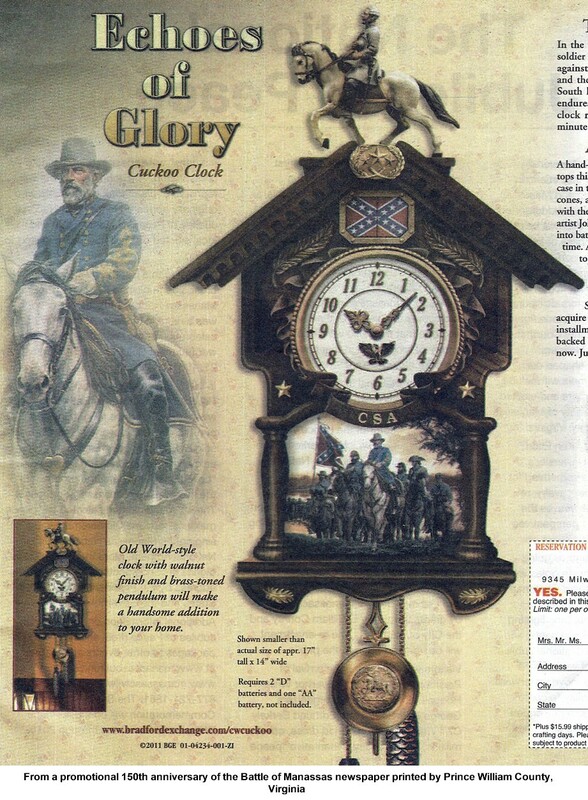 Crap like the "Echoes of Glory Cuckoo Clock" starts appearing. One, Two. 6/9/11 - Posted Confederates on the Rhine. 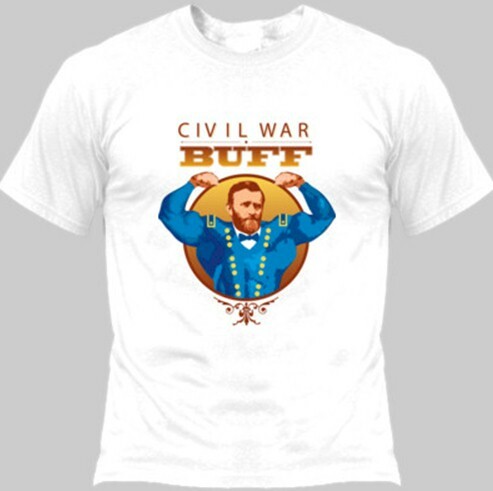 6/2/11 - Posted Civil War Buff Grant. Yeah, baby... the man had GUNS. 5/26/11 - Posted Bruce Catton's excellent The Drummer Boy of the Rappahannock - a minor literary gem. I am impressed with Catton's attitude about the Civil War as reflected in his many books. While he writes with great insight and feeling, he never allows himself to become maudlin or sentimental. He is, above all, a professional journalist and a realist. You can see that in this excerpt. 4/12/11 - Ross Kimmel sent me a photo of four members of the 2nd North Carolina at Appomattox, 1965. I have placed it here (scroll to bottom). 3/1/11 - I am uncertain of the exact day, but I know it was in March 1996 that I first posted JonahWorld! to the World Wide Web, so it has now been fifteen years. I'm an Internet pioneer! 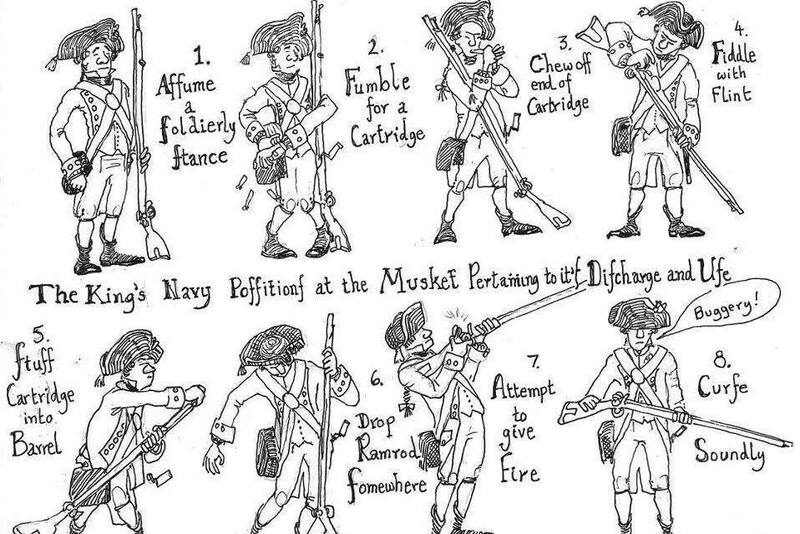 2/25/11 - I'm guessing reenactors will find this How to be a Retronaut page interesting. Note the page about Brand new 18th C. shirts (yawn). 1/13/11 - Added an entry to Stu Zelman's The Civil War/World War II Connection (scroll to bottom). 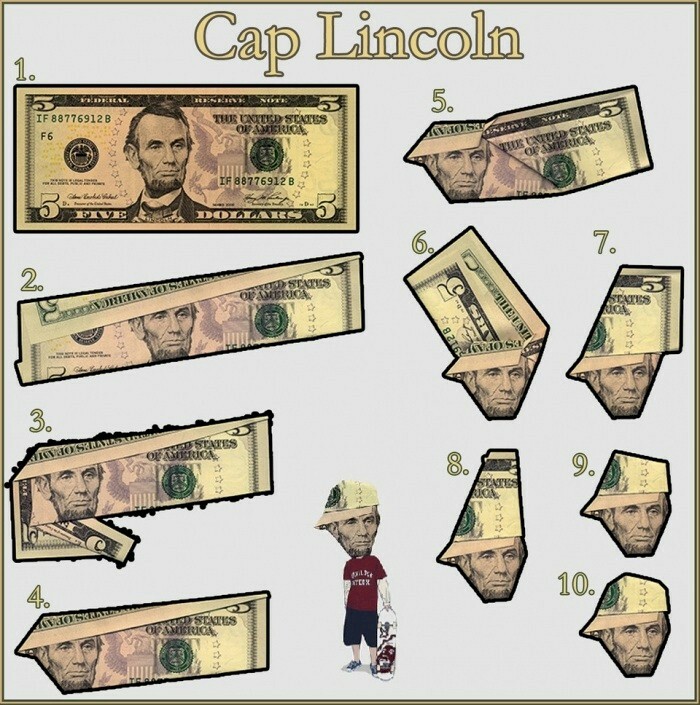 1/11/11 - Added Cap Lincoln, an indispensible addition to the Lincoln culture. 1/3/11 - Yanks versus Dinosaurs. 12/8/10 - Added an entry to the The Civil War/World War II Connection (Helen Longstreet - scroll to bottom). And since it is once again the Christmas season, I draw your attention to the Christmas articles. Merry Christmas! 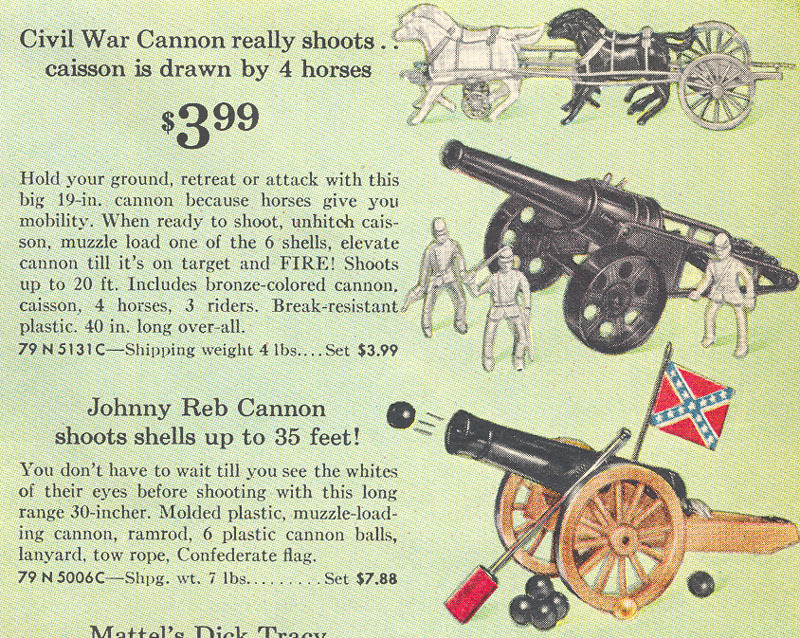 11/9/10 - Back in 1962 even the kiddies could commemorate the Civil War! 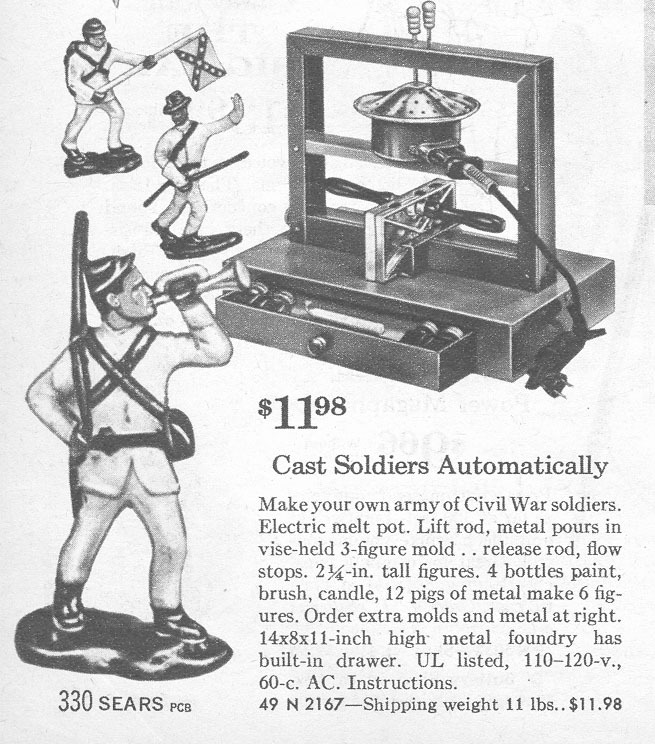 Added Civil War guns (from the 1962 Sears Christmas catalog), Civil War cannon (from the 1962 Sears Christmas catalog), Civil War metal soldier casting set (from the 1962 Sears Christmas catalog), Civil War tents (from the 1962 Sears Christmas catalog), Civil War uniforms (from the 1962 Sears Christmas catalog). 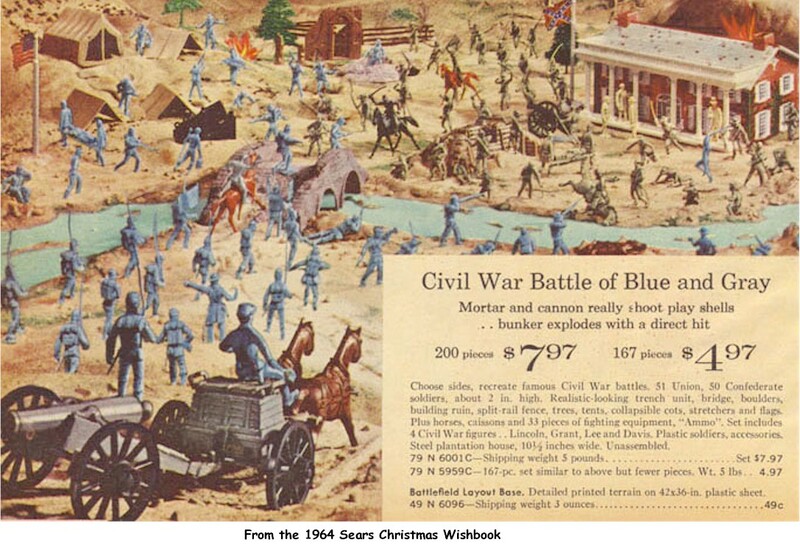 11/5/10 - Added The Blue and the Gray Playset (from the 1962 Sears Christmas catalog). 8/2/10 - Added Abraham Lincoln: Vampire Hunter. 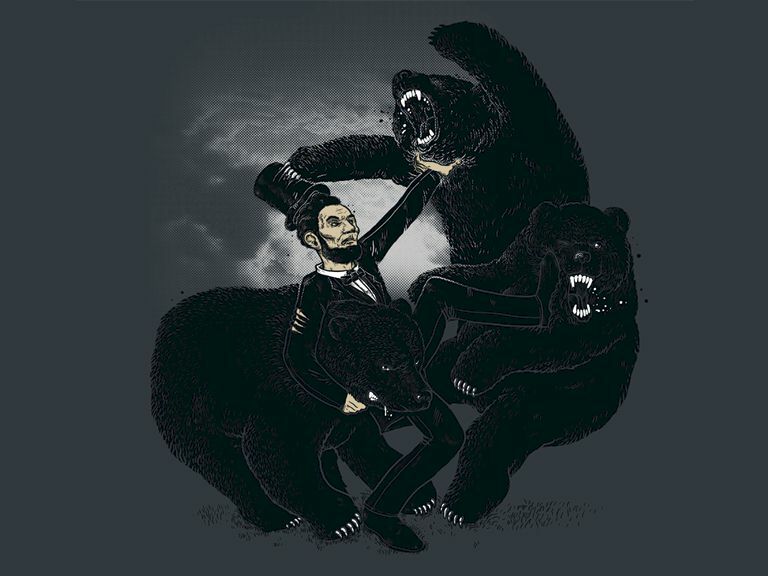 6/16/10 - Added Lincoln wrestling bears (from a tee-shirt design). Really, is there anything Old Abe couldn't do? 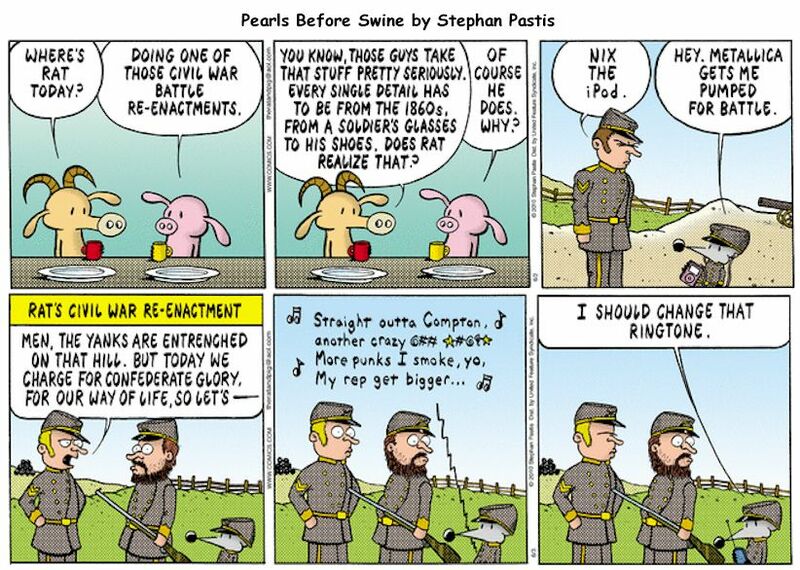 6/3/10 - Added Pearls Before Swine cartoon and Lincoln destroys a city. 5/31/10 - Added CSA dagger. 5/6/10 - Added a link to An Illusion So Real: Civil War Reenactors. 4/28/10 - Added Rock band. 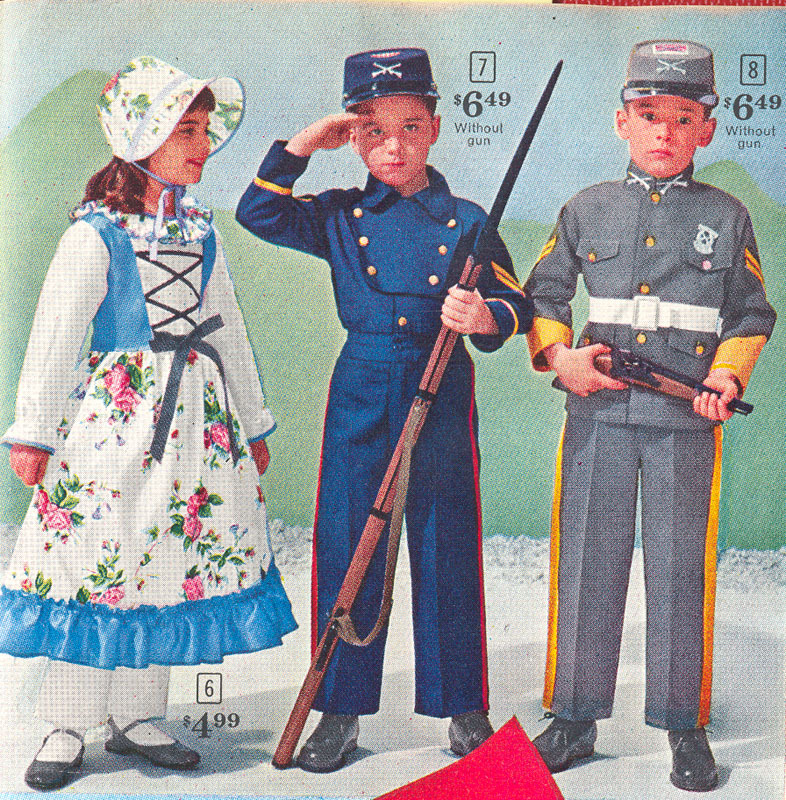 2/23/10 - Added 1964 Sears Yank and Reb uniforms - you know you want one. (By the way, I approve of the poses, where it looks like the junior Yank is about to take the junior Reb prisoner.) 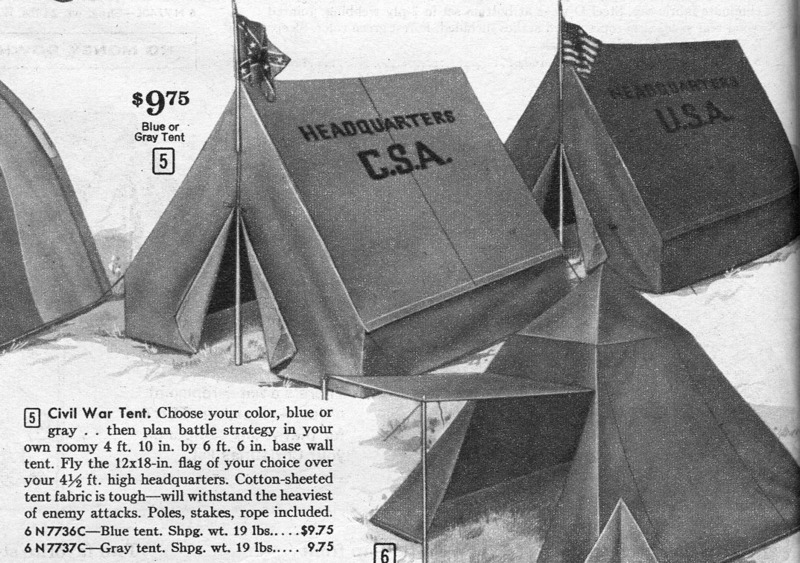 Also added the 1964 Sears Civil War battle set; I would like to have this! 2/12/10 - Added The Second Coming - just in time for President's Day. 1/4/10 - Added an entry to the The Civil War/World War II Connection. 12/9/09 - Posted Studio Macbeth's Digital Abe Lincoln images. Interesting and eerie. 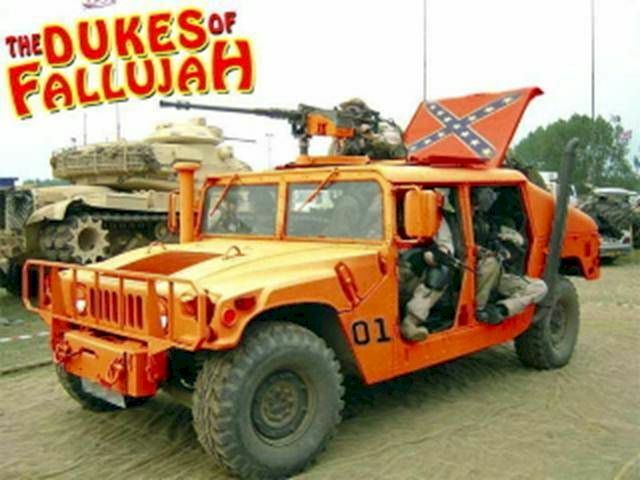 10/14/09 - Posted The Dukes of Fallujah. 10/13/09 - THIS IS GOOD! 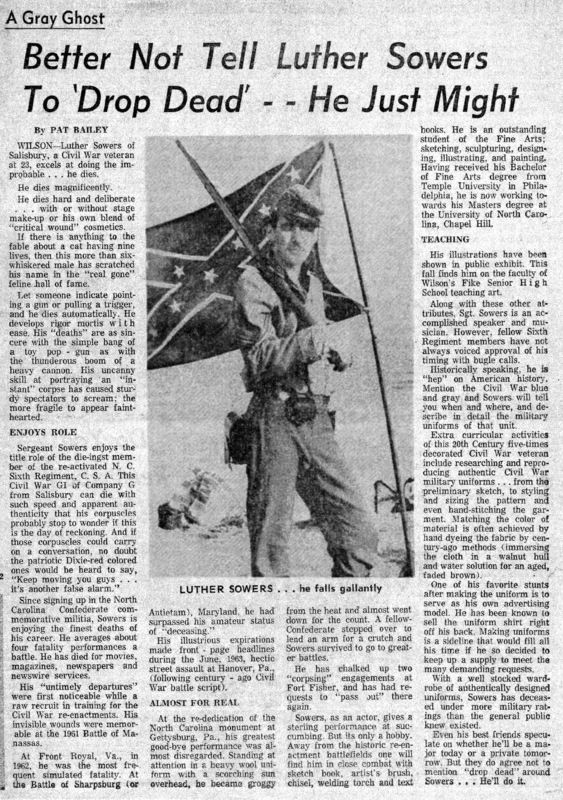 I have posted a video I got from Ross Kimmel to youtube... "A Day in the Life of a Confederate Soldier," filmed in the Summer of 1965 (!) and starring the 2nd North Carolina, one of the first authentic reenactment units. Part One, Part Two. Take a look - I think you will be favorably surprised at the quality of this little production. 09/29/09 - Posted a link to The Civil War/World War II Connection. 09/21/09 - Posted a link to Reenacting the American Civil War in the U.K.
09/09/09 - Posted The Grand Peace Jubilee of 1869. 8/10/09 - Posted A New Appreciation to Hendershotts. 8/5/09 - Time warp shocker! 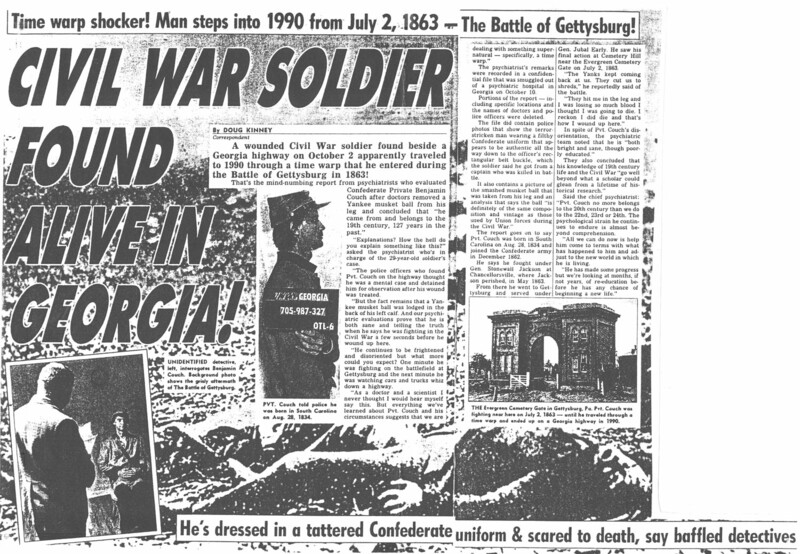 Posted "Civil War Soldier Found in Georgia!" Page one, Page two. 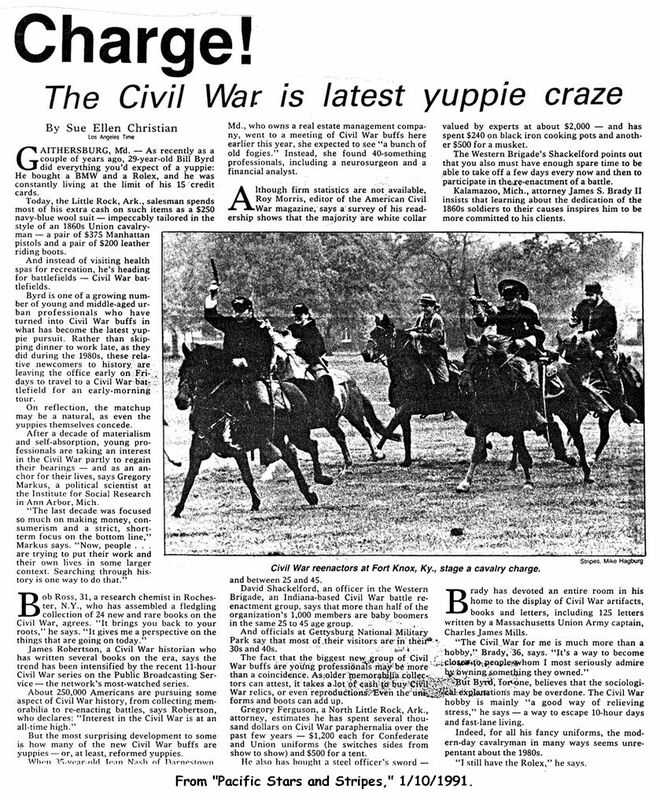 Also posted Civil War is Latest Yuppie Craze. 7/20/09 - Posted A Certain Fatality 2 to Lincolnia. 7/13/09 - Posted Track Torpedoes. 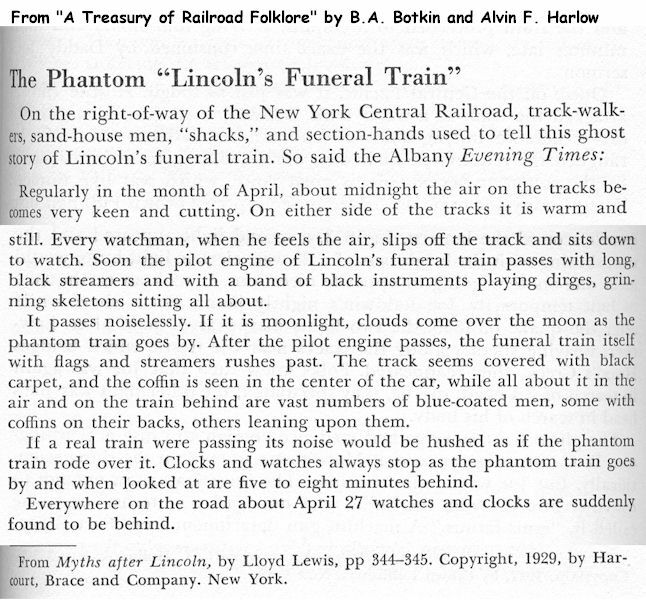 Also added Lincoln's Funeral Train to Lincolnia. 6/30/09 - Posted Ulysses Begone and his iPhone at the Battle of New Market. 5/29/09 - Posted Mr. Show: The Civil War Re-Enactments. 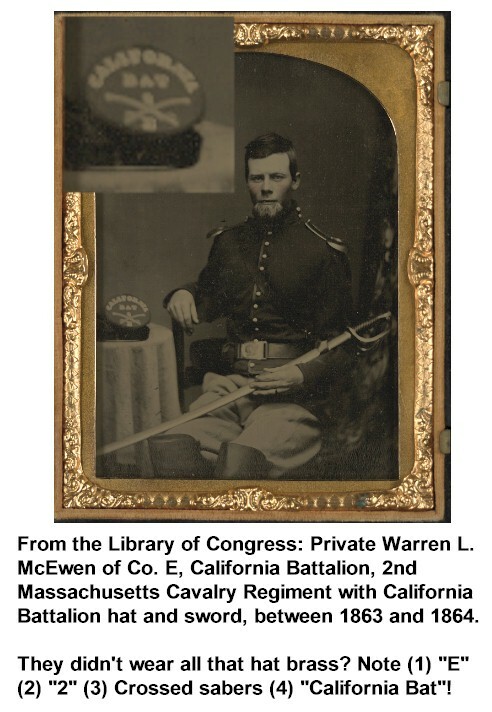 4/3/09 - Posted an update to the Mormon Battalion page. 3/6/09 - Posted a Map of Civil War heritage sites - in Liverpool, England. 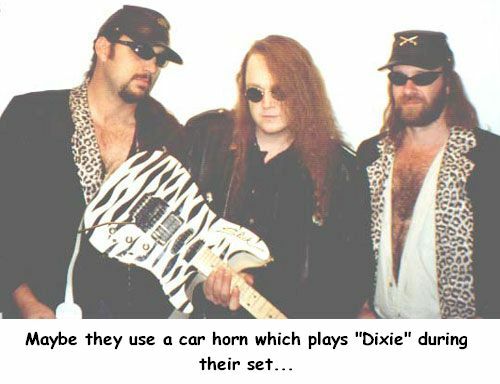 2/27/09 - Added a section from a book I'm reading to my little page about "The Night They Drove Old Dixie Down." 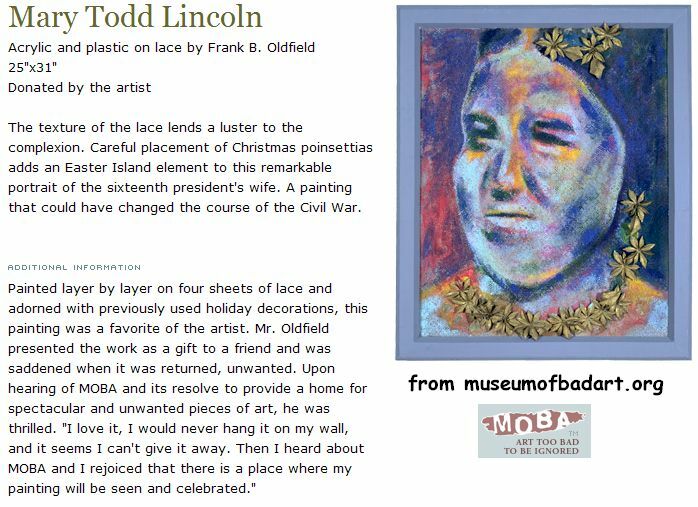 1/22/09 - Added a link to The Museum of Abraham Lincoln Photographs, Miniature Paintings and More to my Lincolnia page. 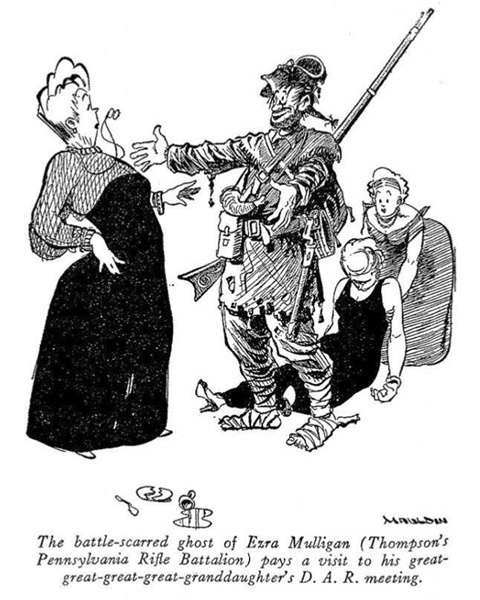 1/9/09 - I want to call your attention to this link: John Tenniel and the American Civil War. Good stuff. 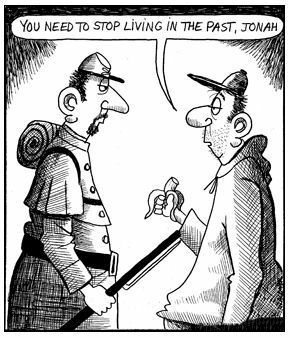 12/27/08 - Posted A Collection of Civil War Humor. 12/23/08 - Posted a link to an article about a 1937 Battle of the Crater reenactment. 12/15/08 - Posted Promotion Time! 12/3/08 - Posted Movie Review: Darkon (2006). Well, it's That Time of the Year again, time to point out that I have a web page filled with Christmas japes and larks. Check it out. 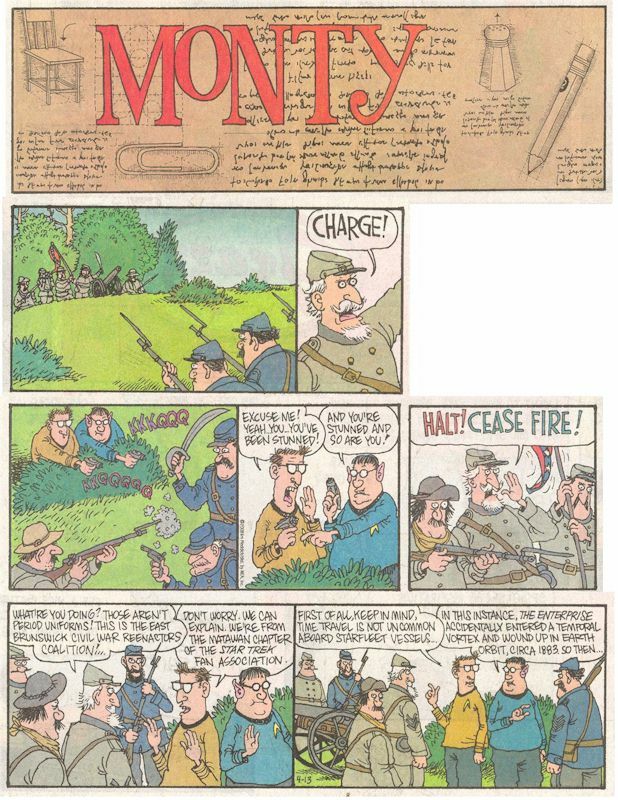 11/6/08 - Posted Boy Scouts With Muskets by an English Correspondent. 11/5/08 - Posted Reenacting the American Civil War in Great Britain by an English Correspondent. 11/3/08 - Last night I saw the alleged film "Two Thousand Maniacs!" (1964) by Herschell Gordon Lewis, a sort of redneck/neo-Confederate version of Brigadoon with gratuitious gore. When I heard "Rebel Yell" (the theme song), I knew it belonged here on JonahWorld! (NOTE: That part where a cat yells is a sequence where a kid puts a noose around a cat's neck and chokes him...) Also, posted Frank Wilkeson's most excellent How Men Die in Battle, from his recollections. 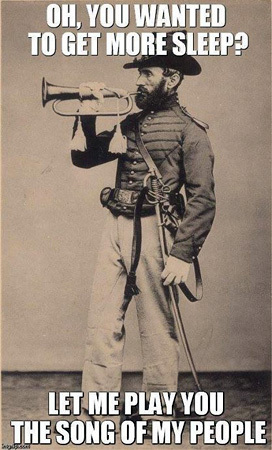 He was an artillerist in the Army of the Potomac. 10/24/08 - I have updated my Reenactor's Movie Guide III to reflect seeing the 1962 Sophia Loren film "Madame Sans-Gêne." 10/1/08 - Okay, here's a good one. Eleven years ago I (and many others) helped Cathy Stanton with her M.A. thesis, "Being the Elephant: The American Civil War Reenacted." 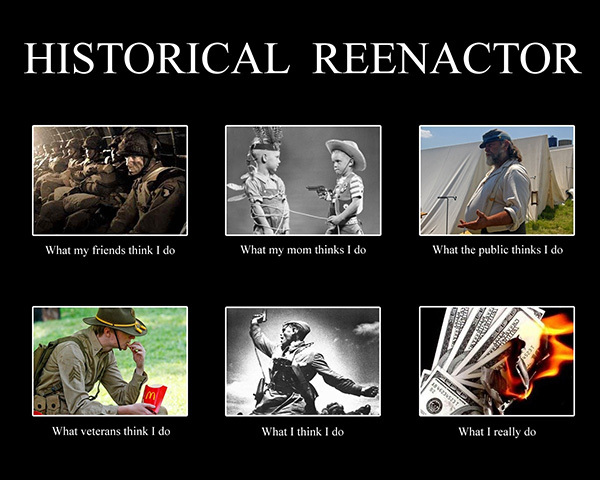 It's good stuff - a major work about reenacting and reenactors. Many insights. She finally posted it to the Internet where you may read it (it's in .pdf form). The link is HERE; it's about a 9 MB file. Excellent reading. Read it! You'll be glad you did. 8/28/08 - Posted a link for "How the South Was Lost," a hilarious youtube video. 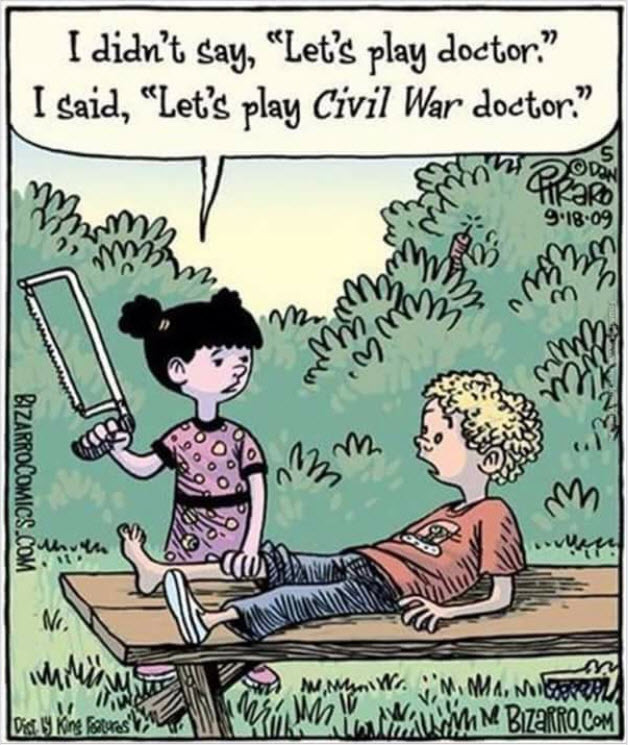 8/18/08 - Posted "Let's End the Civil War!" 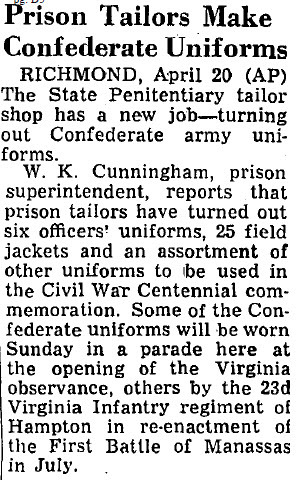 from 1962, an interesting little article about the dawn of modern CW commemorative activity. 8/11/08 - My son Ulysses Begone assures me that all the hip and with-it webmasters make links open new windows when clicked. So I have done that throughout JonahWorld! Also ran a link checker afterwards and removed some dead links. 8/1/08 - Posted Oval sticker. 7/15/08 - Posted "My 15 Minutes Out of the Attic." 7/11/08 - Posted "Once More... With Feeling: Reenactment in Contemporary Art and Culture." 7/3/08 - Merrie Melodies' "Confederate Honey" (1940). Priceless. 7/2/08 - I review "C.S.A. : The Confederate States of America" (2004), a mockumentary. 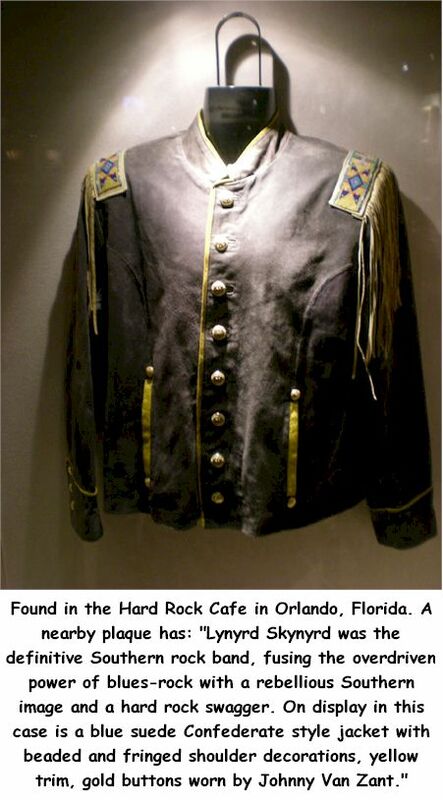 6/12/08 - Posted Uniform coat of the Sweet Home Alabama Regiment. While Zant might not like Neil Young ("Southern Man don't need him around"), you have to admit that Young is a whole lot less farby. 5/21/08 - Posted The Lee Stooges. Mal Stylo returns! 5/5/08 - Posted Cardboard cartridge box (as used at a reenactment). 2/26/08 - Posted Flight Deck cartoon (Photoshoppped by a friend). 1/29/08 - Posted Not all Civil War trivia is factual! 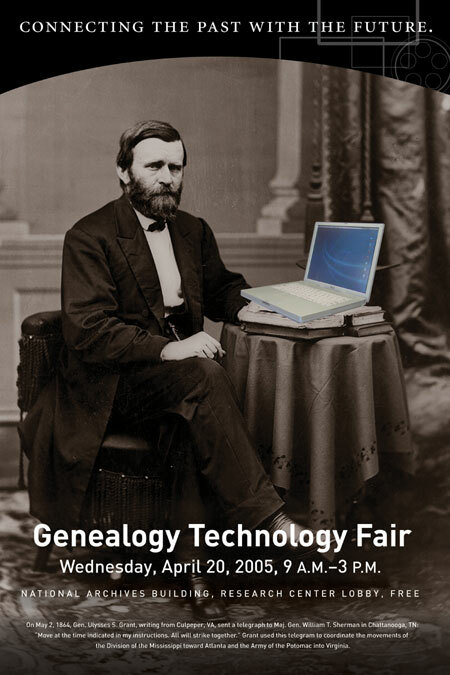 1/8/08 - As a misty-eyed retrospective, I have posted The Good and the Bad of the 125th Anniversary Events. Also, a previously unpublished Mal Stylo diskette comes to light: The Wartime Journal of Mal Stylo! 1/1/08 - Normally I clear out this page every year but this year, since I am now doing reenacting again, I think I'll leave the 2007 updates linked here... Happy new Year! 12/18/07 - Added A Politically Correct Christmas to my Christmas page. On a less festive note, I also added A Little Justice, Please (“Underwear” Mosby). 12/10/07 - Added Four for Freedom: America's First Abolitionists. 11/27/07 - Added Abe Lincoln Cherished Myths. 11/26/07 - Added an excerpt from a book I'm reading, here (more info about the famous "Bixby Letter"). 11/21/07 - Eli Whitney. Everyone knows that his invention of the cotton gin indirectly caused the Civil War because it made cotton a viable crop, right? (I've been reading that for decades.) Wrong. Added a book excerpt to my short cotton gin article here. 11/15/07 - Posted Randolph County Rebel: Jim Kincade, the 7th Arkansas Infantry, and Reenacting the American Civil War. 11/5/07 - Posted The Five Worst Events I Have Ever Done. 10/24/07 - Posted A Certain Fatality... to Lincolnia. 10/11/07 - I know it's a little early in the season (I haven't even gotten out the tree), but, awww... what the heck? Posted The Rebel Christmas Song by Gary Edmisten. 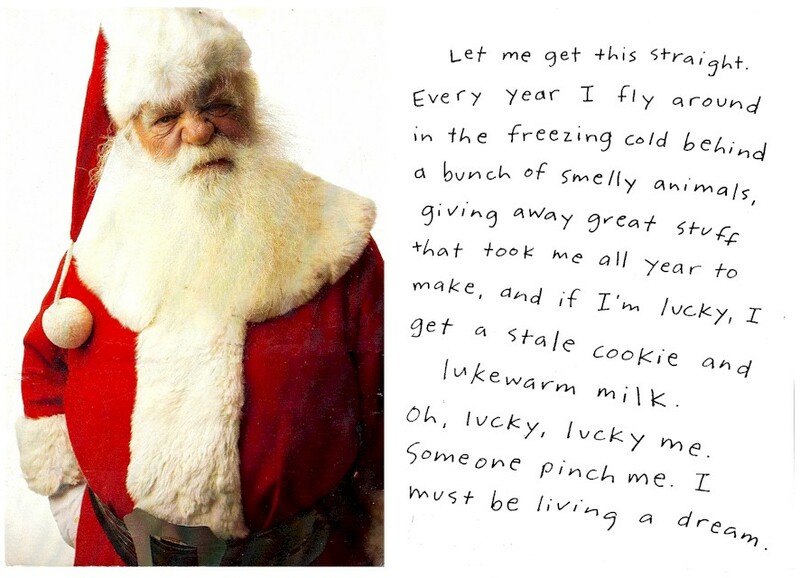 More heart-warming Christmas stuff here. 10/9/07 - Posted Rebel raider disguised in hoop skirt - a rip-snorter of a tale! 10/3/07 - Posted Dixie Tradition Kept Alive In Brazil Enclave. More about Confederados (Brazilian Rebs), here. 9/26/07 - Posted Troop Surge. 9/13/07 - Posted Some Notes on New Millennium Reenacting. 9/11/07 - Posted Eating Crow. 8/14/07 - Added Lincoln's Doppleganger. 8/13/07 - Added The Sundered Banner. 7/6/07 - Added Civil War Reenactors Live To Fight Old Battles and Antebellum Southern Christianity. 6/25/07 - NOTE: There are a lot of articles and writing on JonahWorld!, not all of which I myself wrote. I think the majority of the content comes from somewhere else. I credit it wherever possible, however sometimes I have to write something like, "Found on the Internet" when I don't know the source. So, if it doesn't say, "by Jonah Begone" somewhere in the article, I didn't write it. 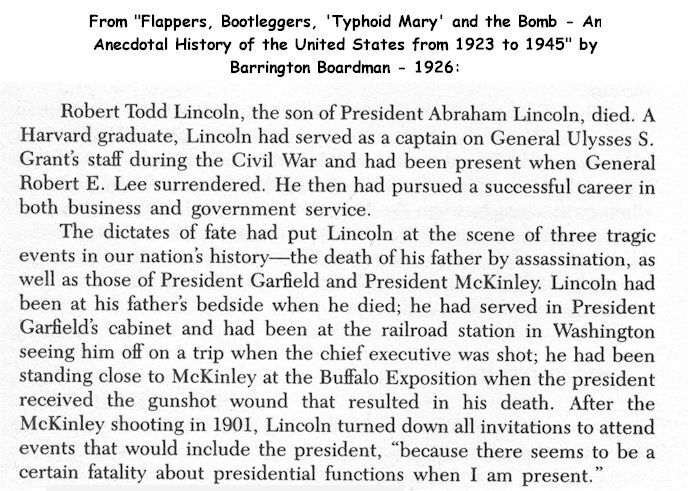 5/22/07 - Added Could Modern Trauma Care Have Saved Abraham Lincoln? and Did Lincoln Belong to the Angels or the Ages? 5/17/07 - Added Change the past. 5/15/07 - Added Lincoln's Burial (and Re-burials). 5/1/07 - Added Reenacting as Religion. 4/10/07 - Added Two Photographic Imponderables. 3/27/07 - Added The Times They Were A-Changin' and Mary Todd Lincoln. 3/23/07 - Added Moxie to Hendershotts. 3/15/07 - Did Robert E. Lee really make a comment about the superior generalship of the Media? 2/20/07 - Posted Battles over Battlefields. Also, posted What's a Cotton "Gin?" 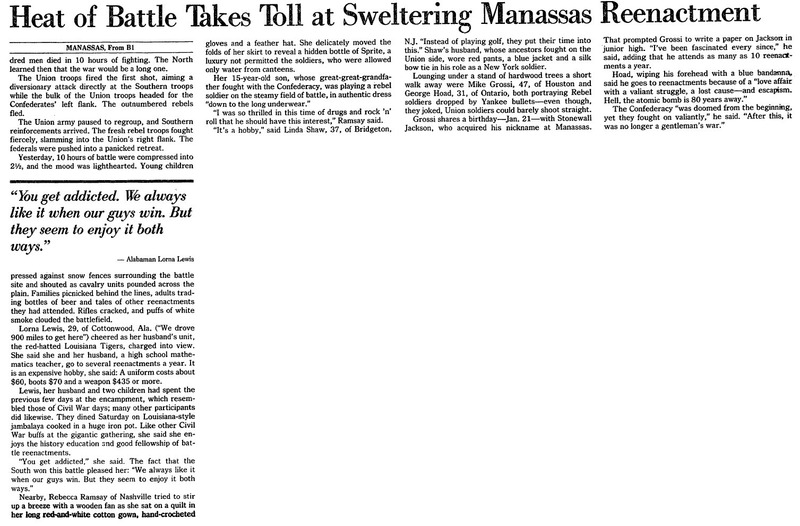 2/14/07 - It being 2007, we're going to hear a lot about Jamestown, Virginia in 1607. But is this really where America began? TAKE MY SURVEY! When and Where Did America Begin? 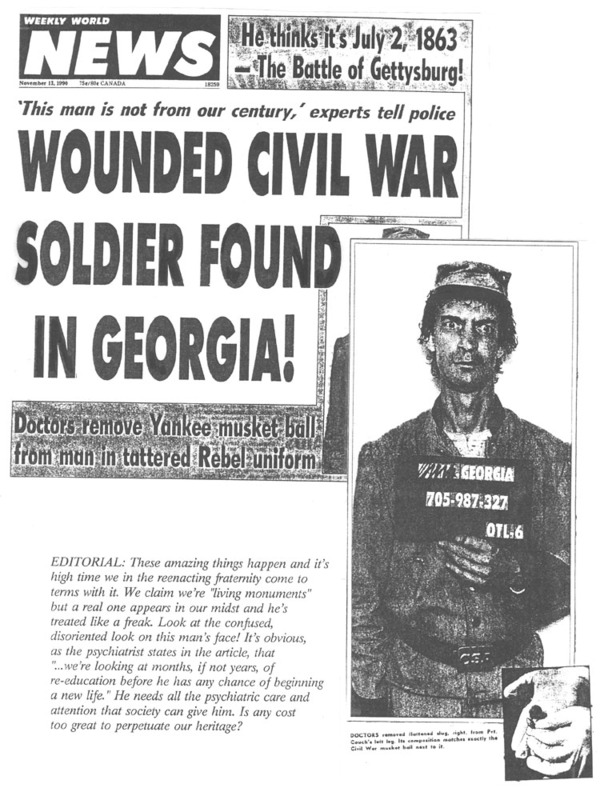 1/29/07 - Posted Re-enactor presents Civil War medicine as it was. 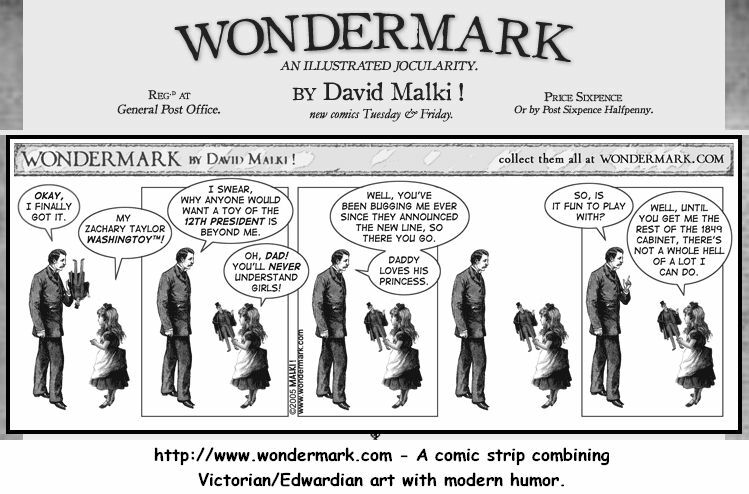 1/24/07 - It occurs to me that reenactors might like Wondermark, a strip combining 19th C. art with modern humor. 1/3/07 - Happy new year! Posted Conflict of Interest.